Compilation of all names and terms in the Sailor Moon universe. Use the alphabetic list below to skip to a section of your choice. First appearance in volume 4, act 19. One of Green Esmeraude's minions. Part of the Boule Brothers and the Black Moon. First and only appearance in Short Stories volume 1, Chibi Usa's Picture Diary #2: Beware of the Tanabata. The real identity of Kengyū and husband of Vega (Shokujo). Refers to Cere Cere, Jun Jun, Ves Ves and Palla Palla of the Dead Moon. First appearance in volume 1, act 2. 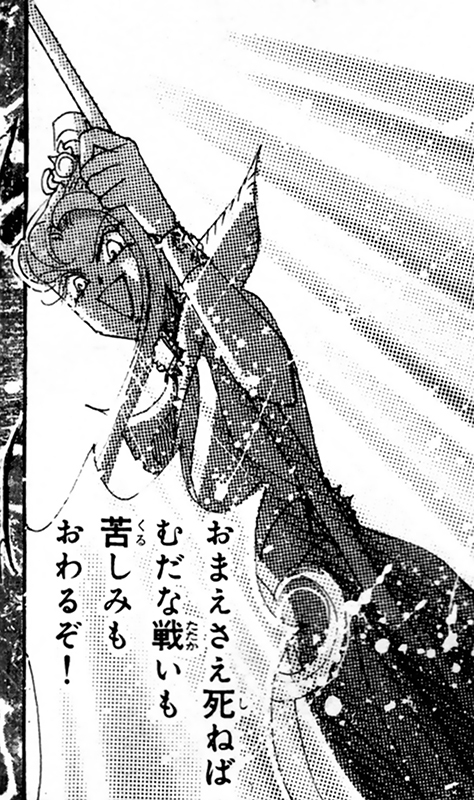 Sailor Mercury's civilian identity. 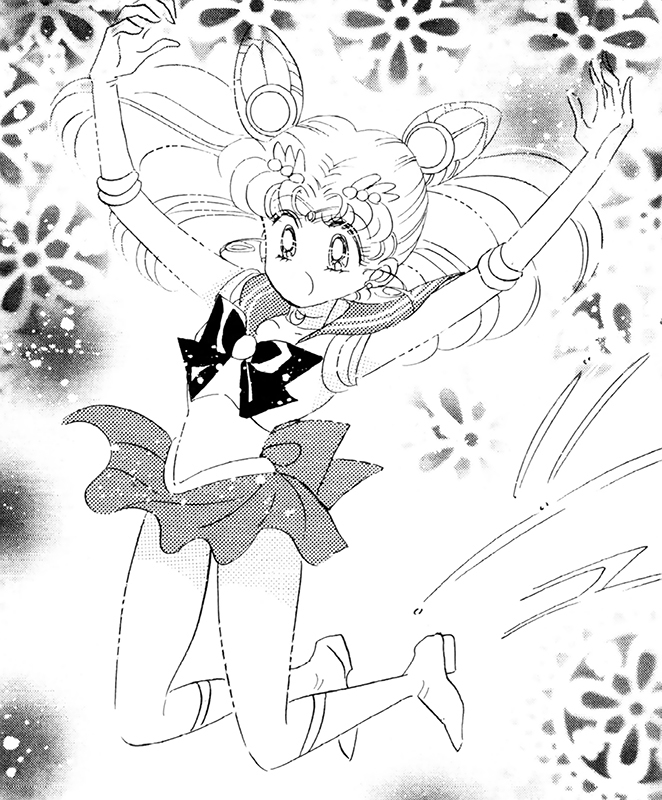 First and only appearance in Short Stories volume 2, Parallel Sailor Moon. She's Ami Mizuno's daughter in the parallel universe. First appearance in volume 1, act 3 as a cat. 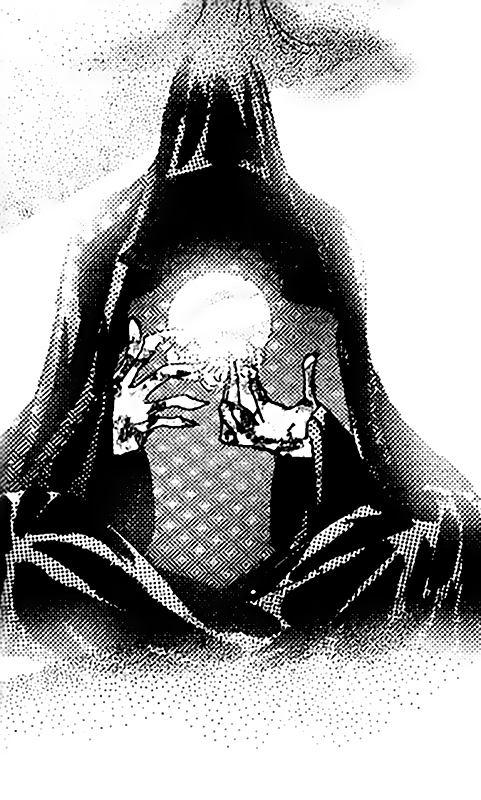 First human form appearance in volume 9, act 43. First appearance in volume 5, act 22. One of Blue Saphir's droids and part of the Black Moon. First appearance in volume 3, act 15. Part of the Four Weird Sisters and the Black Moon. 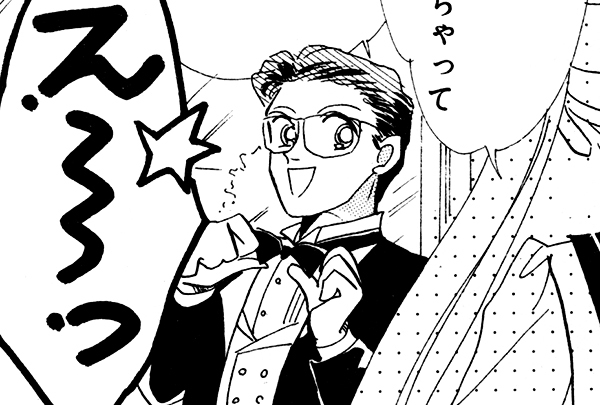 First appearance in volume 5, act 22. The brainwashed alter ego of Chibi Usa. Part of the Black Moon. First appearance in volume 3, act 15. Term referring to the Black Moon Clan. First appearance in volume 3, act 15. Consists of Prince Demand, Blue Saphir, Green Esmeraude, Crimson Rubeus, Black Lady, Wiseman, Death Phantom, Chiral, Achiral, Veneti, Aquatici and the Four Weird Sisters. First appearance in volume 3, act 15. Part of the Black Moon. 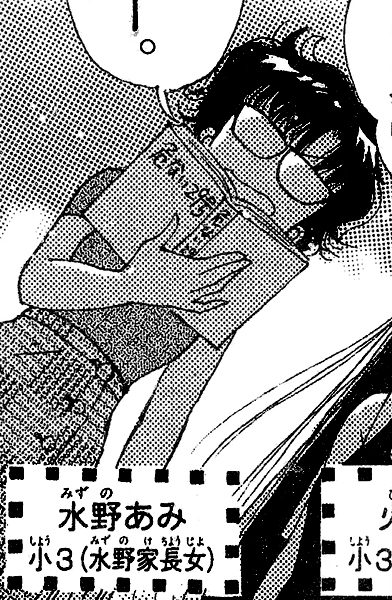 First and only appearance in Short Stories volume 1, Exam Battle #2: Ami-chan's First Love. 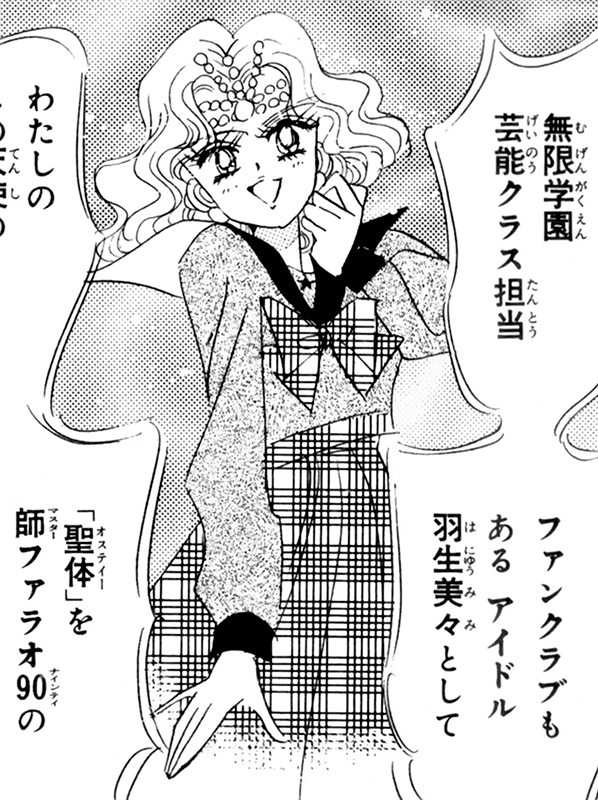 A genius locī who was mistaken by Ami Mizuno as her rival. Refers to Achiral and Chiral of the Black Moon. First appearance in volume 8, act 39. Part of the Amazones Quartetto and the Dead Moon. First apperance in volume 12, act 55. The source of all evil in the galaxy. First appearance in volume 3, act 14. 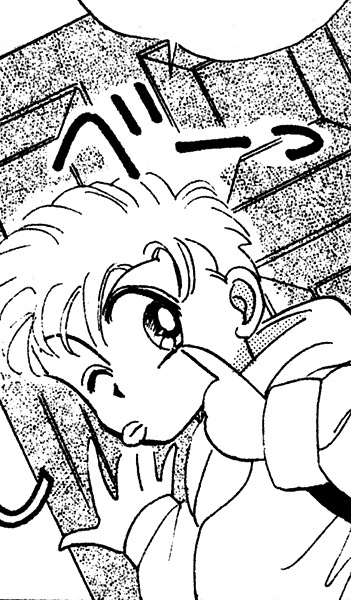 Sailor Chibi Moon's civilian identity. 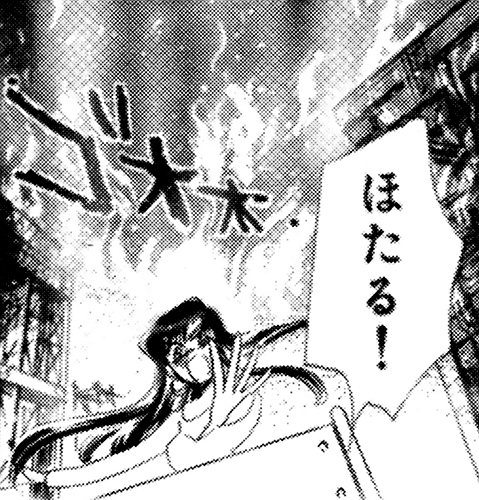 First appearance in volume 6, act 27. Part of the Witches 5 and the Death Busters. First appearance in volume 6, act 27. Beings from the Tau Star System implanted into living creatures by the Death Busters. 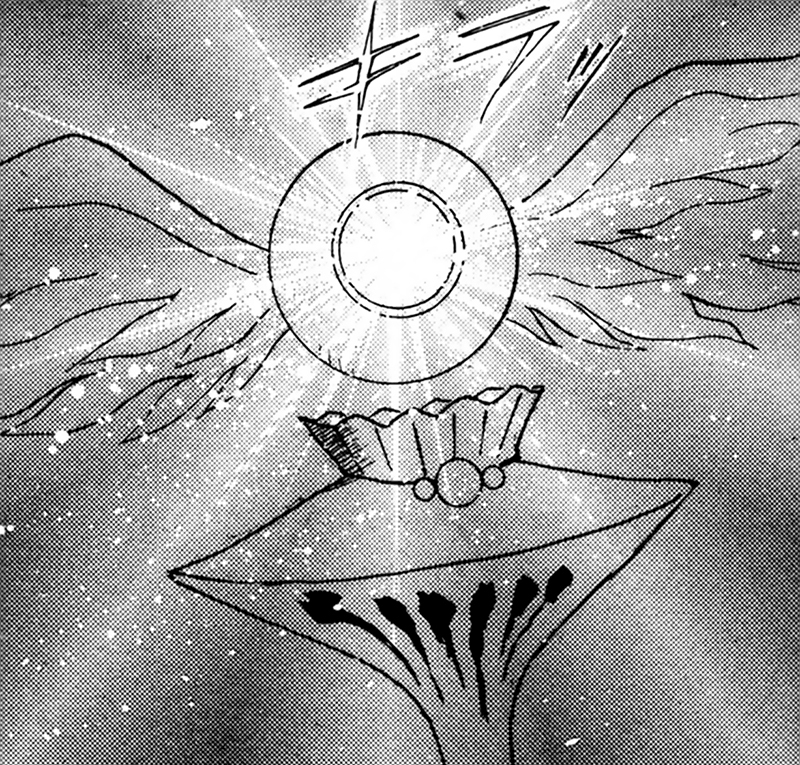 Term for the evil organization consisting of Queen Nehellenia, Zirconia, Zircon, Tiger's-eye, Hawk's-eye, Fisheye, Ves Ves, Palla Palla, Jun Jun, Xenotime and Xeolite. First mentioned in volume 6, act 28. 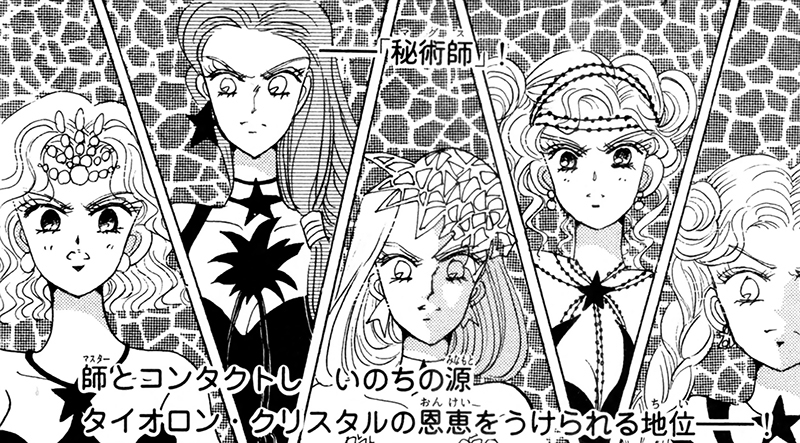 Term for the evil organization consisting of Pharaoh 90, Professor Tomoe, Kaolinite, Mistress 9, and the Witches 5. First mentioned in volume 6, act 28. First appearance in volume 3, act 15. Also goes under the name "Wiseman". Part of the Black Moon. First appearance in volume 1, act 3 as crows. 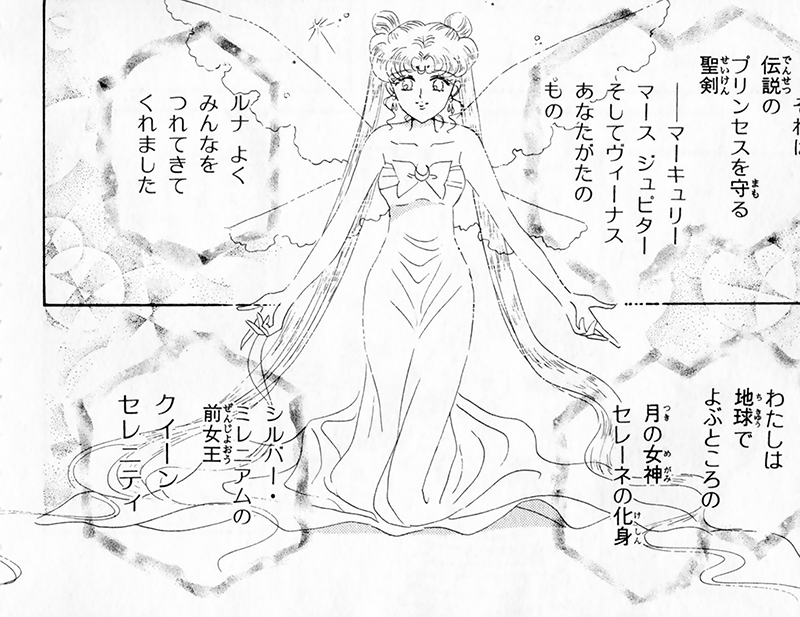 First human form appearance in volume 9, act 41. 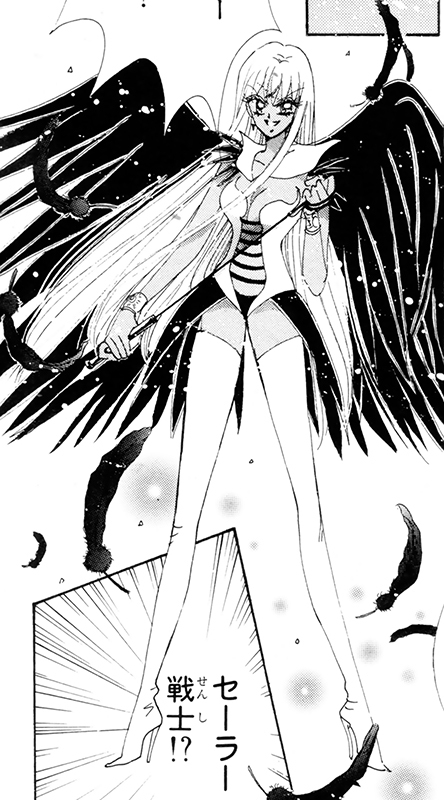 One of Rei Hino's guardian crows. First appearance in volume 3, act 15. 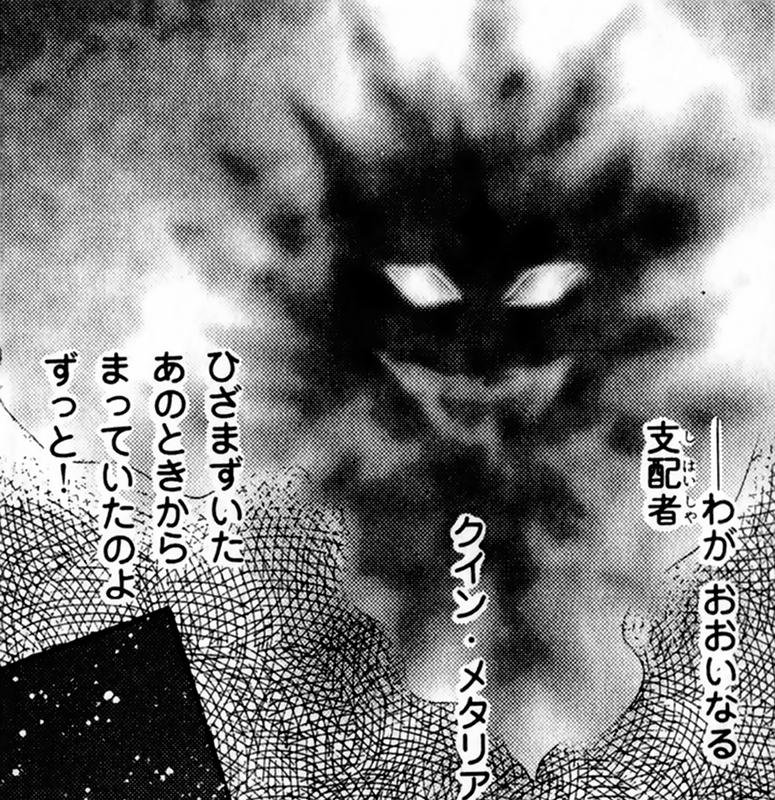 Human-shaped black creatures used in battle by the Black Moon Clan. Part of the Black Moon. First appearance in volume 2, act 11. A friend of Motoki Furuhata. 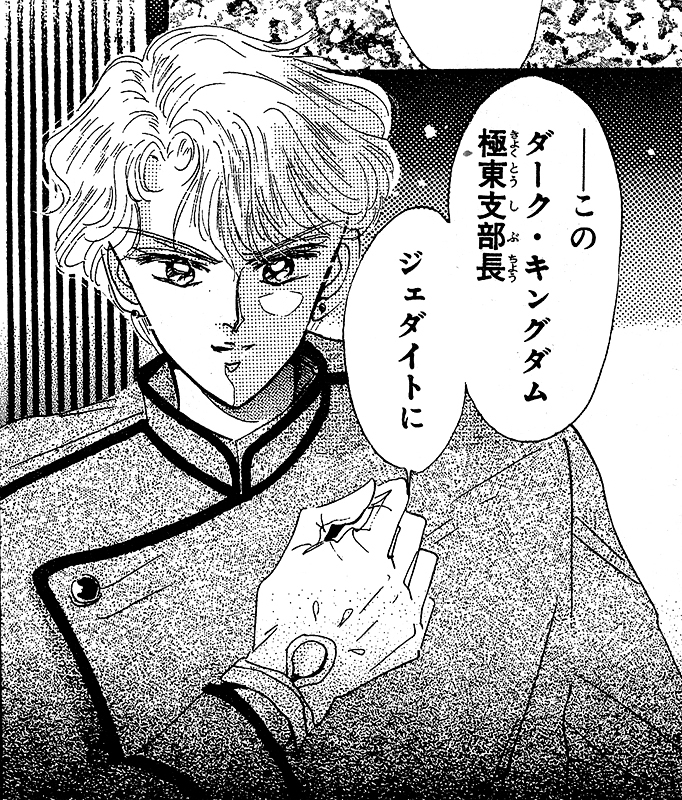 The brainwashed Mamoru Chiba stole his identity and posed as as Endō while under Queen Beryl's control. First and only appearance in Short Stories volume 1, Chibi Usa's Picture Diary #2: Beware of the Tanabata. 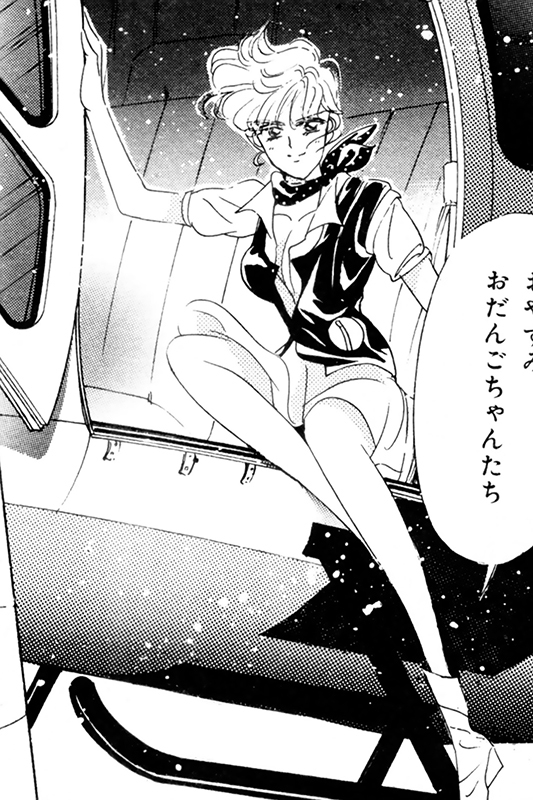 She's a personification of the weaver star Zeta. 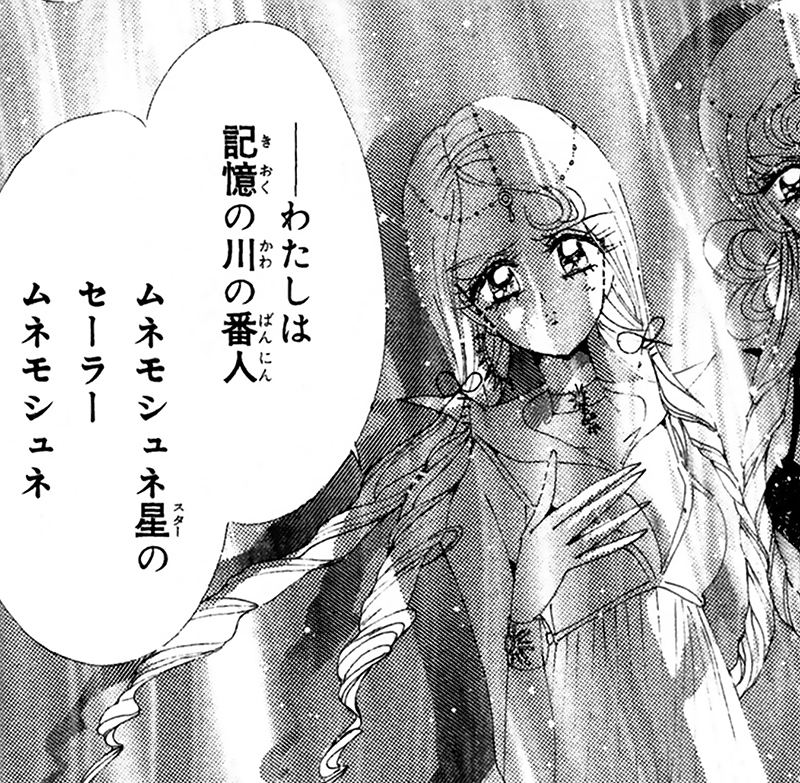 It's unknown who is Zeta and who is Epsilon of the two. First appearance in volume 10, act 48. Third form of Sailor Moon. First appearance in volume 8, act 39. Part of the Amazon Trio and the Dead Moon. Refers to Jadeite, Nephrite, Zoisite and Kunzite of the Dark Kingdom. Refers to Kōan, Berthier, Petz and Calaveras of the Black Moon. First and only appearance in Short Stories volume 1. A term referring to a guardian or protective spirit of a particular area. Resin, Ghost Sistern, Ōtakura, Bonnōn and Tōhī-chan are genius locī. First appearance in volume 7, act 35. Part of the Death Busters. 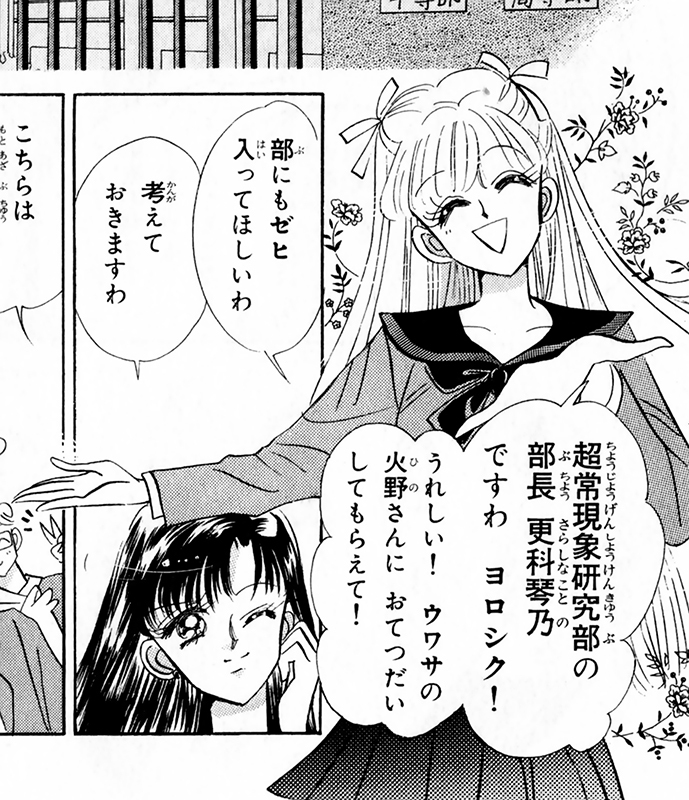 First and only appearance in Short Stories volume 1, Exam Battle #3: Rei and Minako's Girls School Battle. A genius locī who was sealed inside a well at the T·A Academy for Girls. First mentioned in volume 12, act 60. The guardian of the Chaos Seed. First appearance in volume 12, act 60. The guardian of the Cosmos Seed and the Galaxy Cauldron. 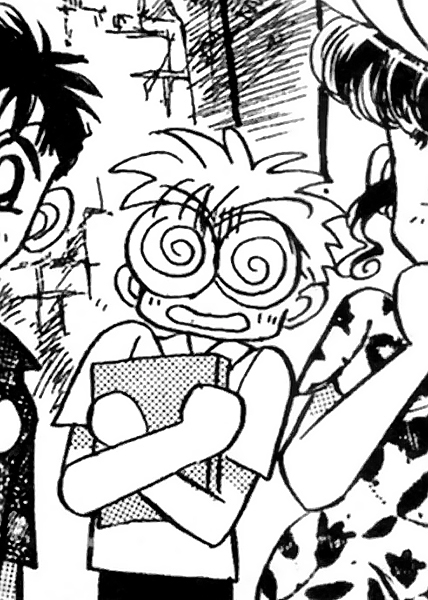 First appearance in Short Stories volume 1, Chibi Usa's Picture Diary #1: Beware of the Transfer Student. Chibi Usa's classmate and friend of Kyūsuke Sarashina. 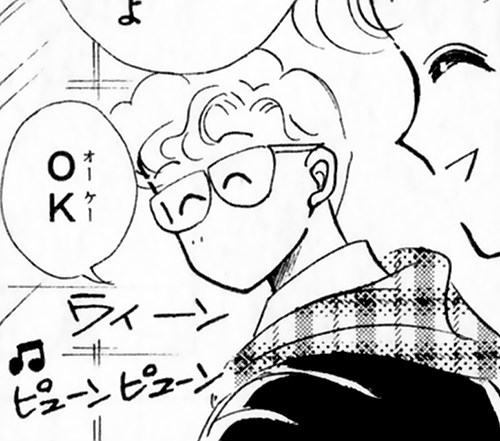 While unconfirmed, he is most likely the younger brother of Hikaru Sorano from the Sailor V manga. First appearance in volume 1, act 1. 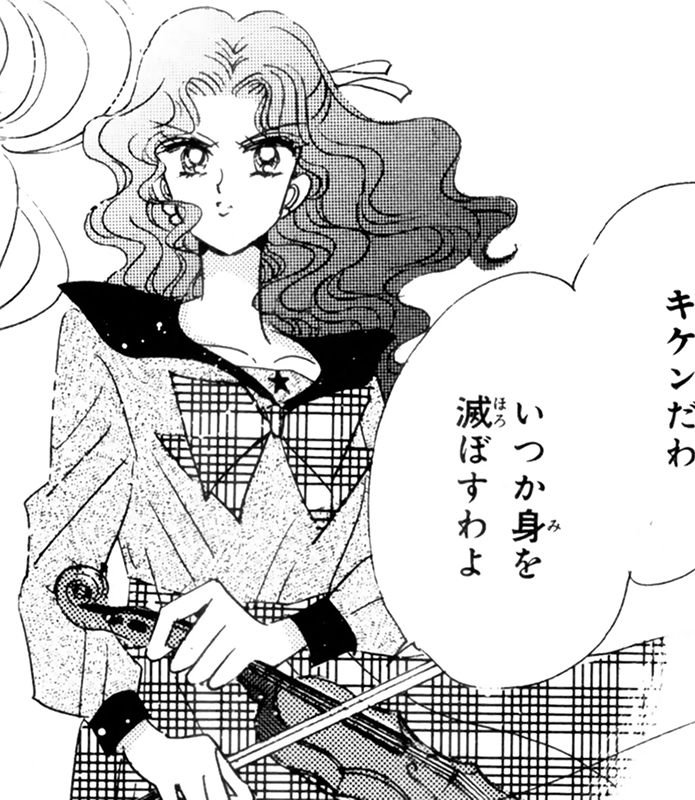 Usagi Tsukino's and Naru Ōsaka's friend and classmate. 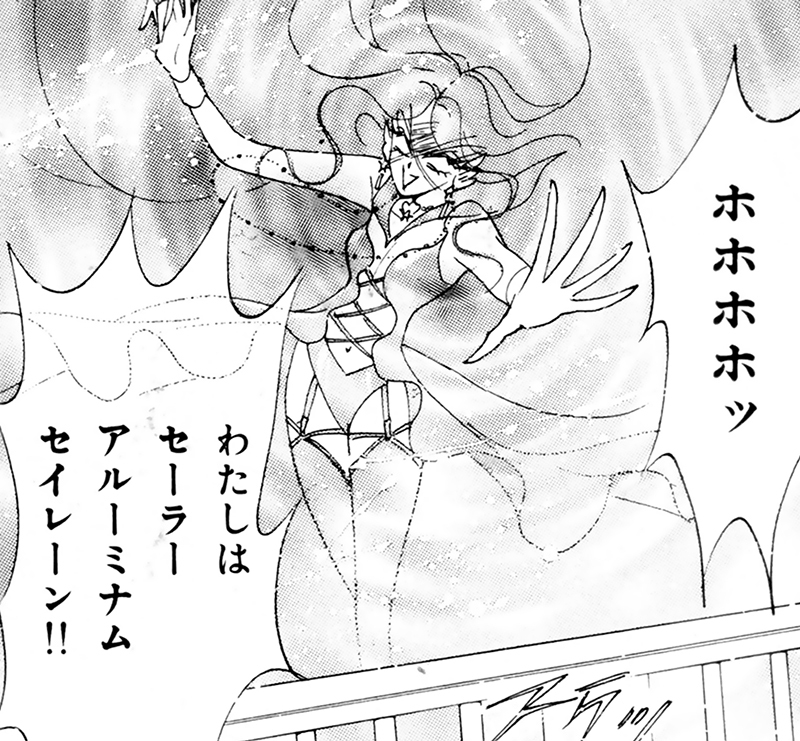 First appearance in volume 6, act 27. 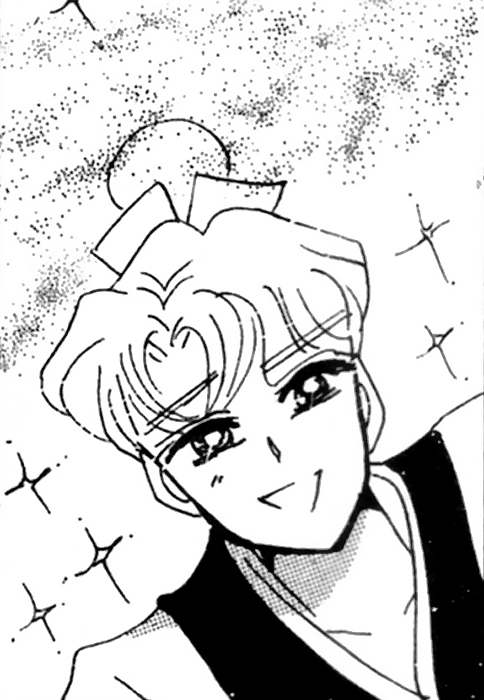 Sailor Uranus' civilian identity. First appearance in volume 1, act 1. 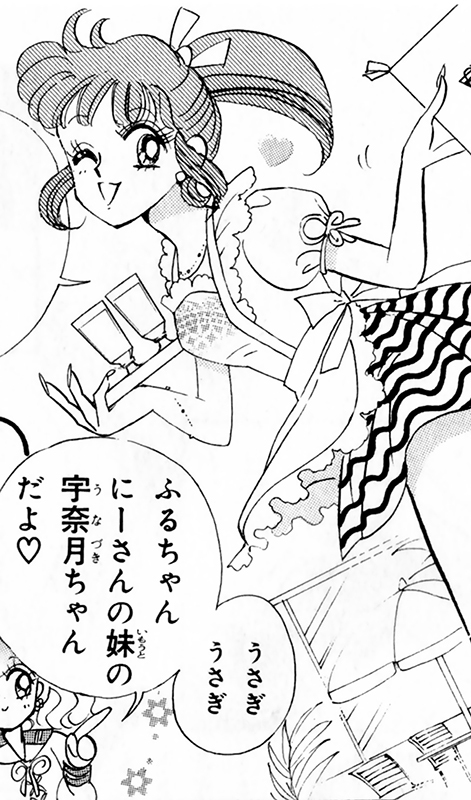 Usagi Tsukino's homeroom teacher. 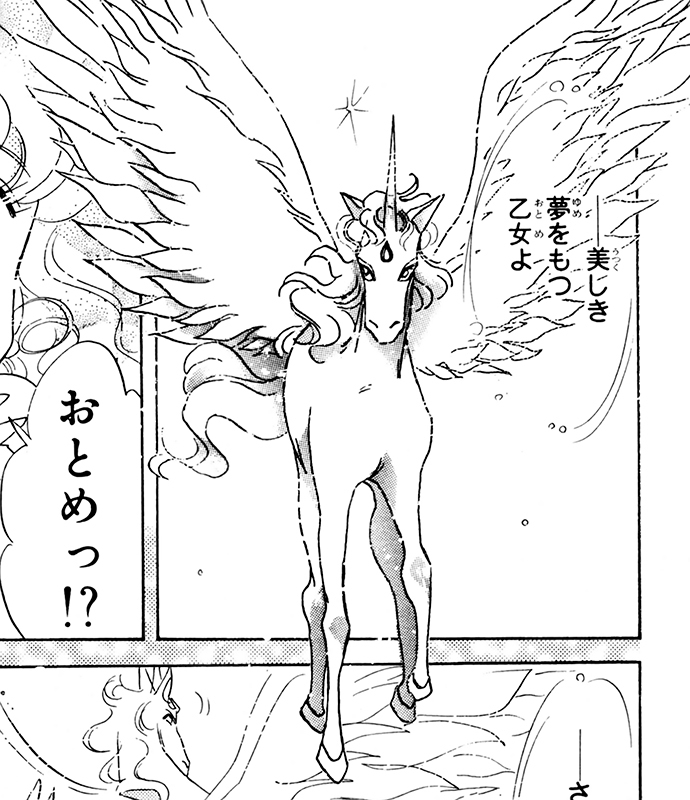 First appearance in volume 8, act 39 as Pegasus. 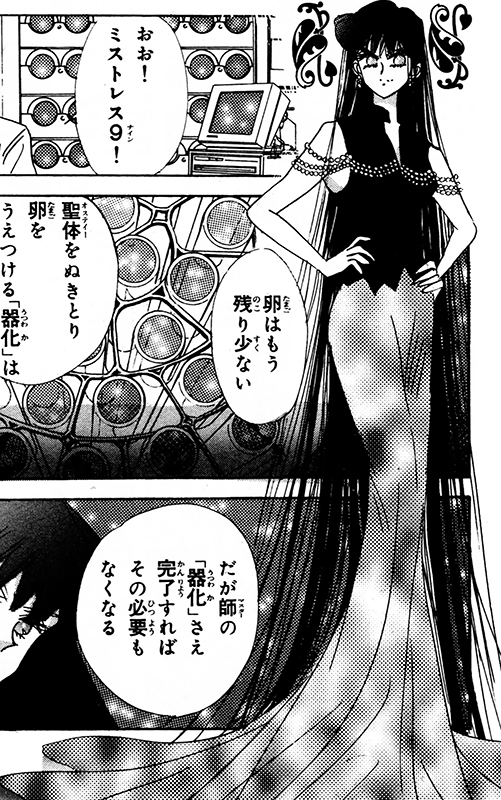 First human form appearance in volume 9, act 41. He is the priest of Elysion. 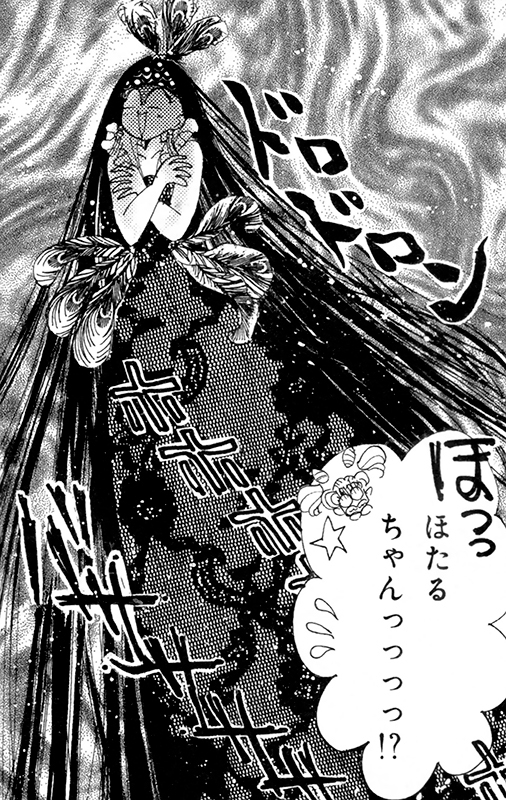 First and only appearance in Short Stories volume 2, The Lover of Princess Kaguya. She's an astronaut and friend of Kakeru Ōzora. First appearance in volume 6, act 27. 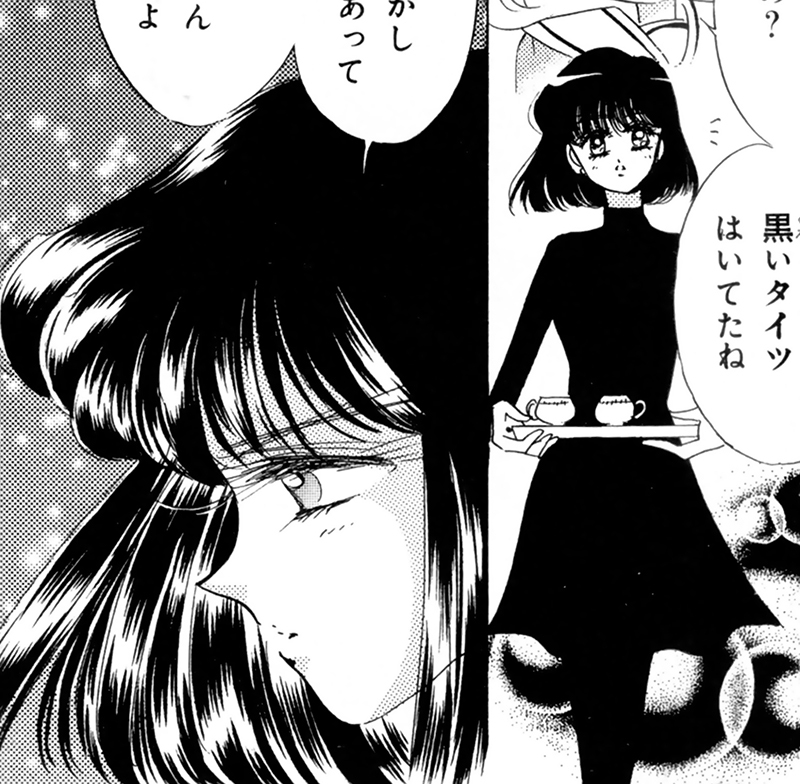 Sailor Saturn's civilian identity. First appearance in volume 1, act 1. 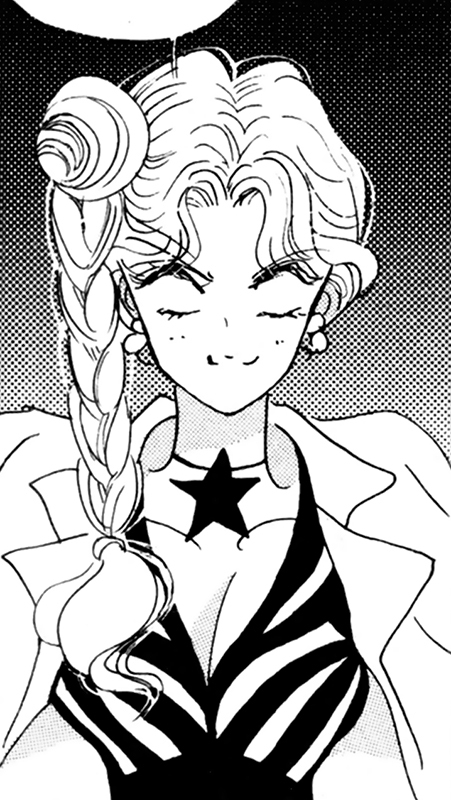 Usagi Tsukino's mother and wife of Kenji Tsukino. First appearance in volume 3, act 15. 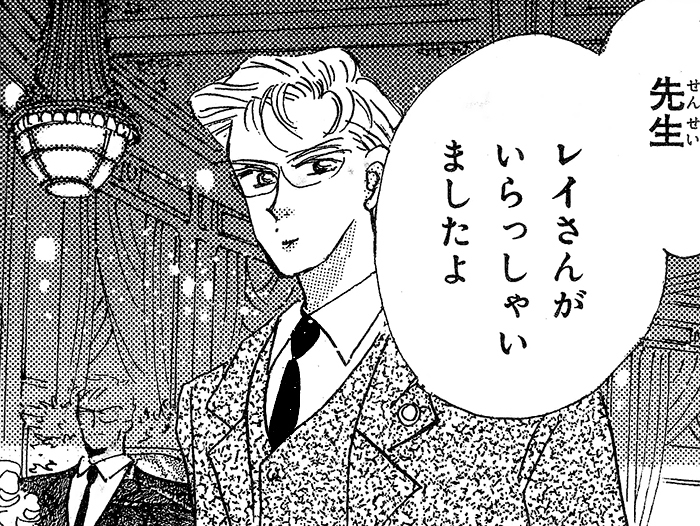 Acquaintance of Mamoru Chiba. First appearance in volume 1, act 1. 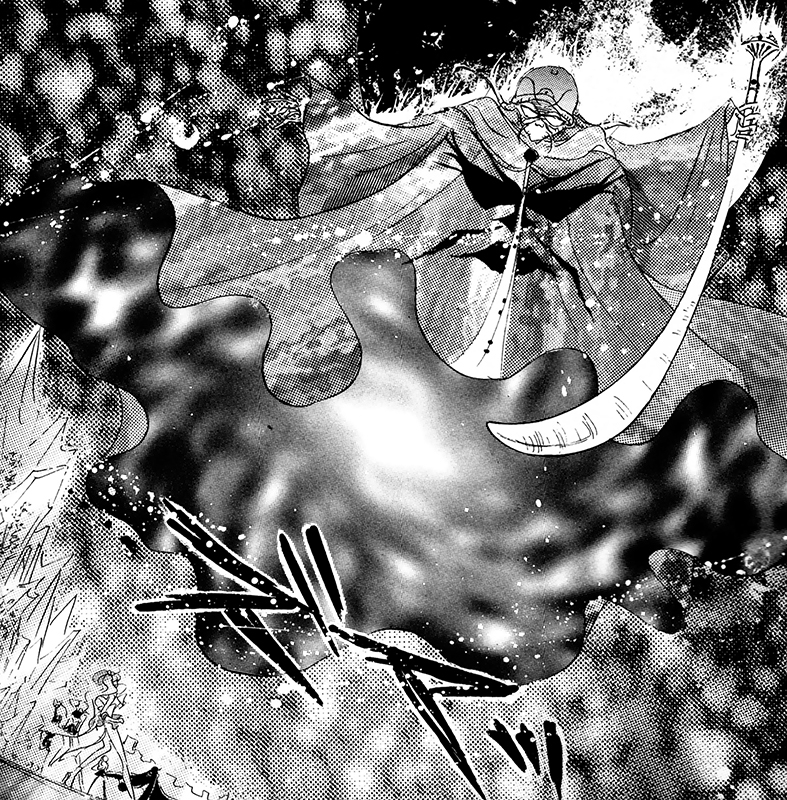 Part of the Four Heavenly Kings and the Dark Kingdom. First and only appearance in Short Stories volume 2, Casablanca Memories. 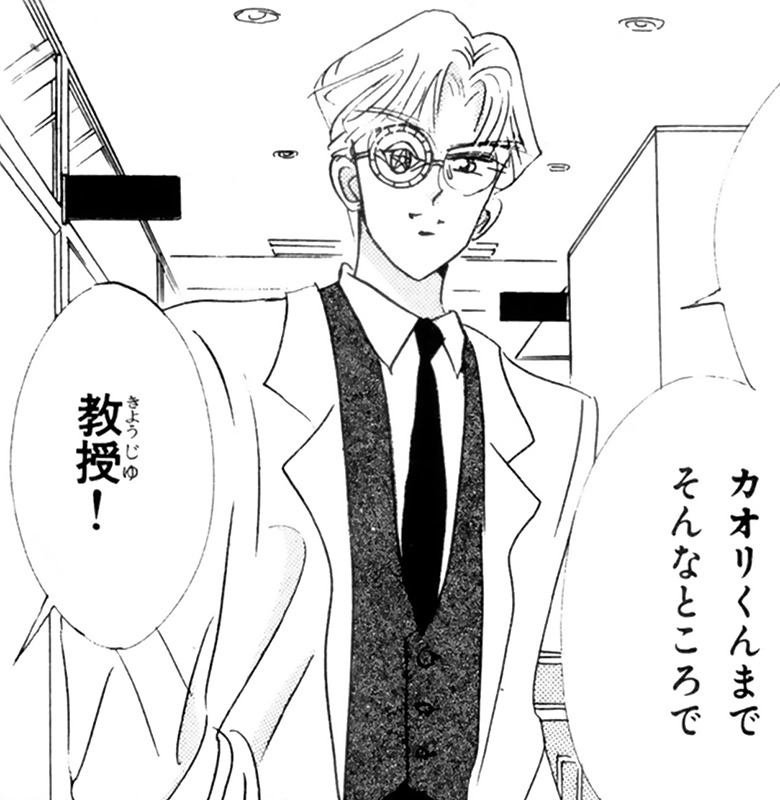 He works as a secretary to Rei's father. 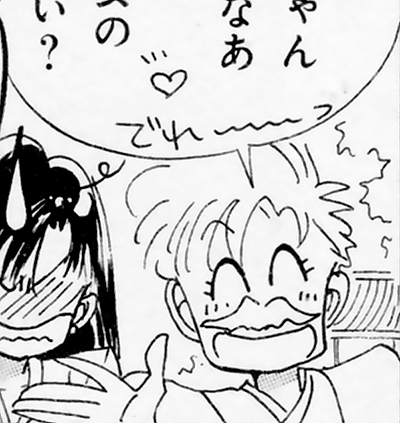 First and only appearance in Short Stories volume 2, The Lover of Princess Kaguya. He's an astronomer and friend of Himeko Nayotake. First appearance in volume 6, act 27. Part of the the Death Busters. First appearance in volume 6, act 28. 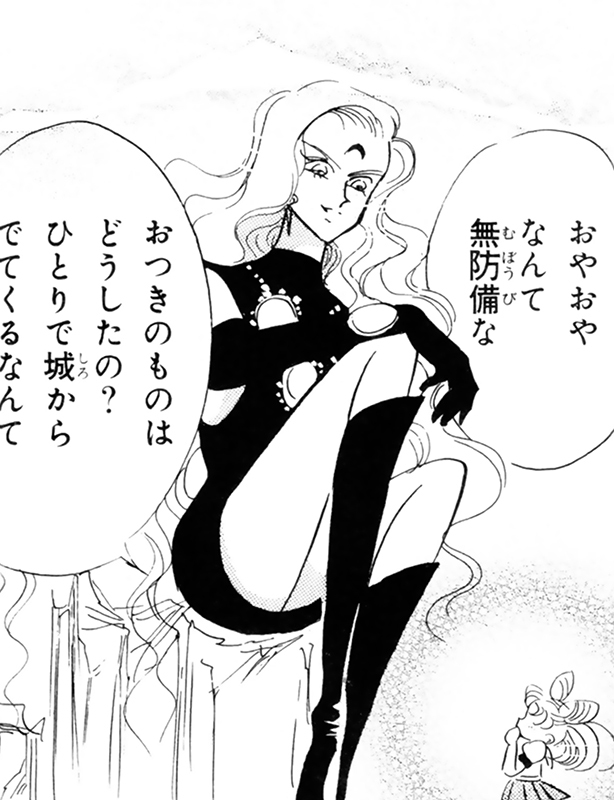 The alter ego of Kaolinite. 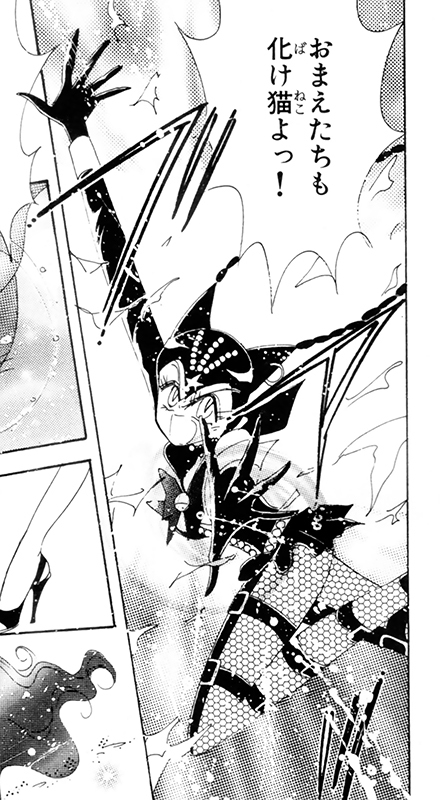 First and only appearance in volume 7, act 32. 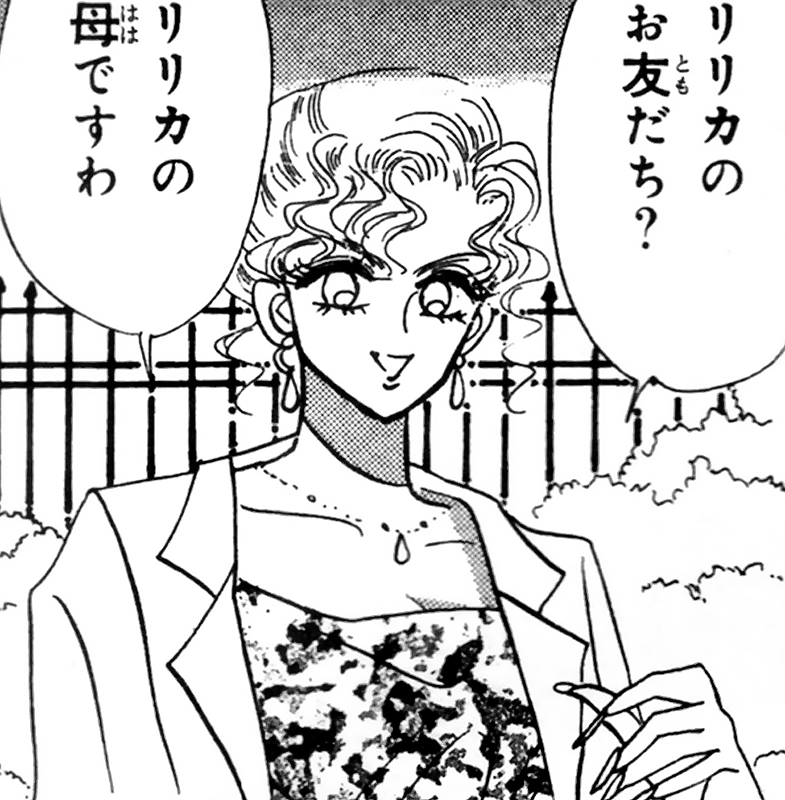 She was Hotaru Tomoe's mother, and passed away in a fire when Hotaru was little. First and only appearance in Short Stories volume 1, Chibi Usa's Picture Diary #2: Beware of the Tanabata. 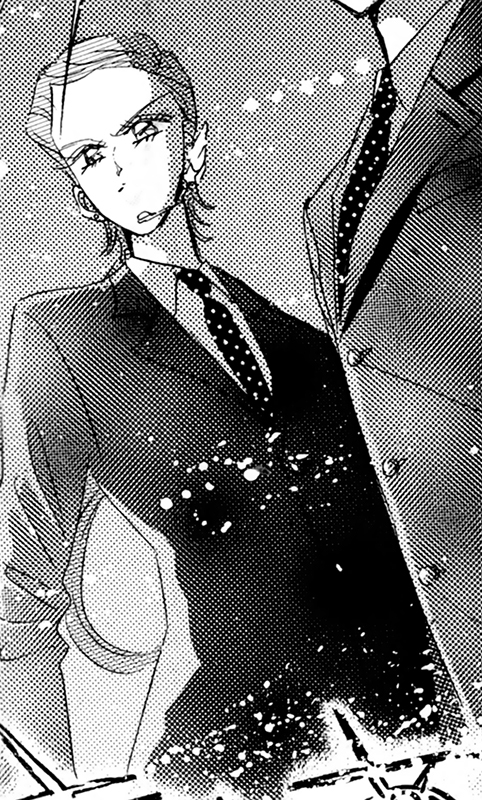 The personification of the star Hikoboshi (Altair; star in the constellation Aquila) and husband of Shokujo (Vega). First appearance in volume 1, act 4. 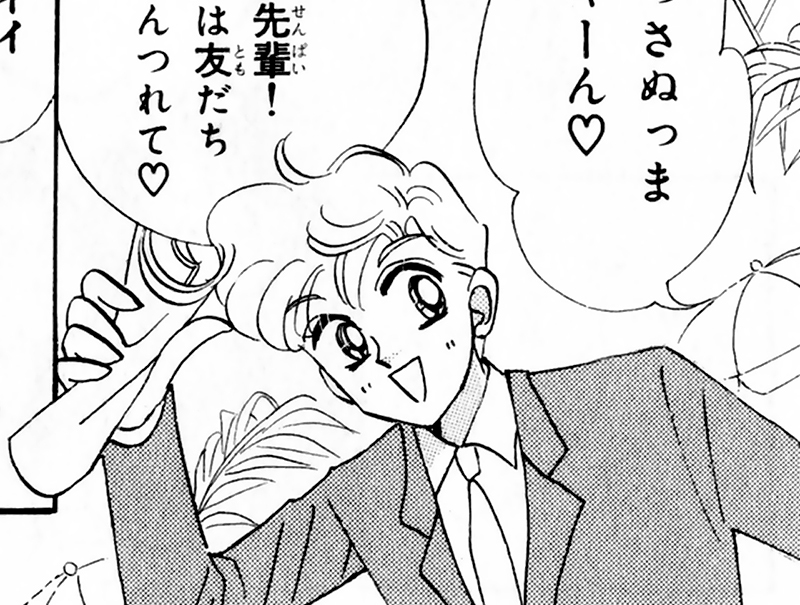 Usagi Tsukino's father and husband of Ikuko Tsukino. First appearance in volume 4, act 19. 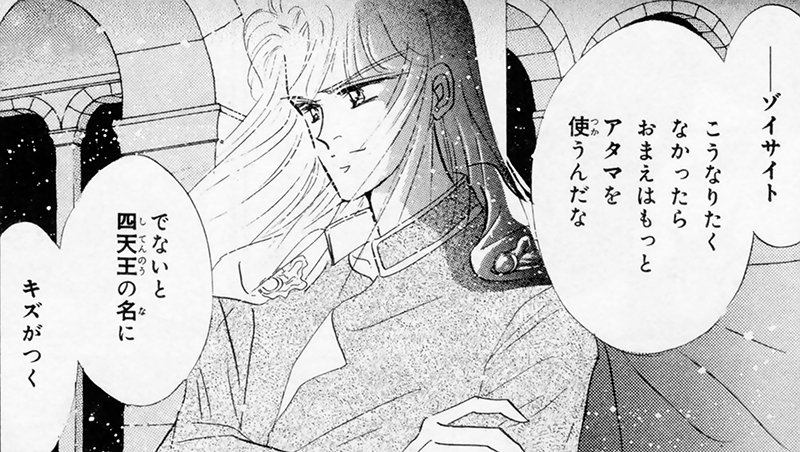 He is the king of Crystal Tokyo in the 30'th century, and the future form of Mamoru Chiba. He is also Chibi Usa's father. First appearance in volume 3, act 15. Kyūsuke Sarashina's older sister. 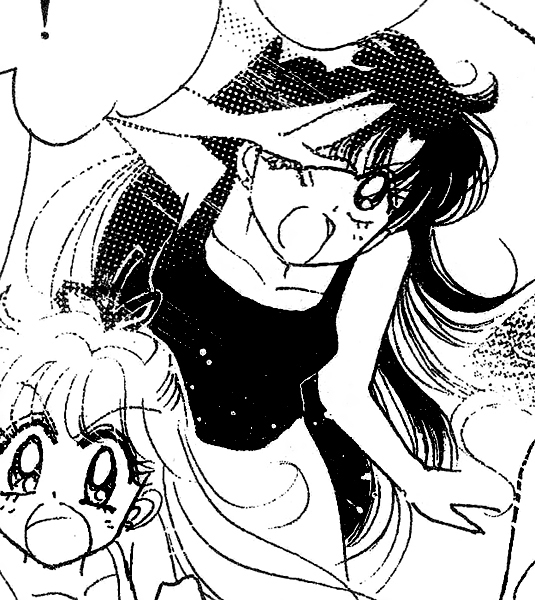 First and only appearance in Short Stories volume 2, Parallel Sailor Moon. 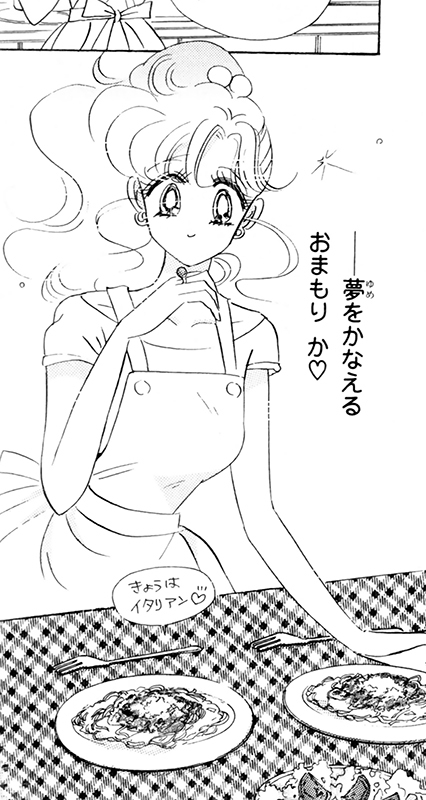 She's Usagi Tsukino's second daughter in the parallel universe. First appearance in volume 1, act 5. 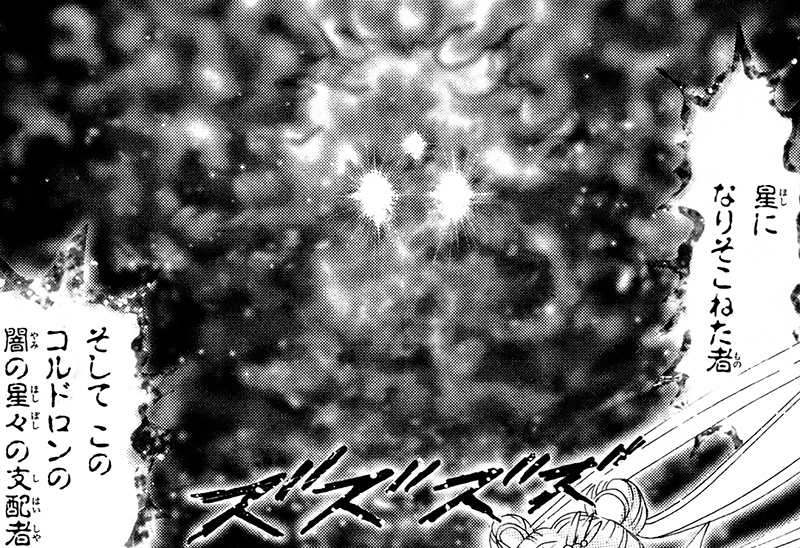 Part of the Four Heavenly Kings and the Dark Kingdom. 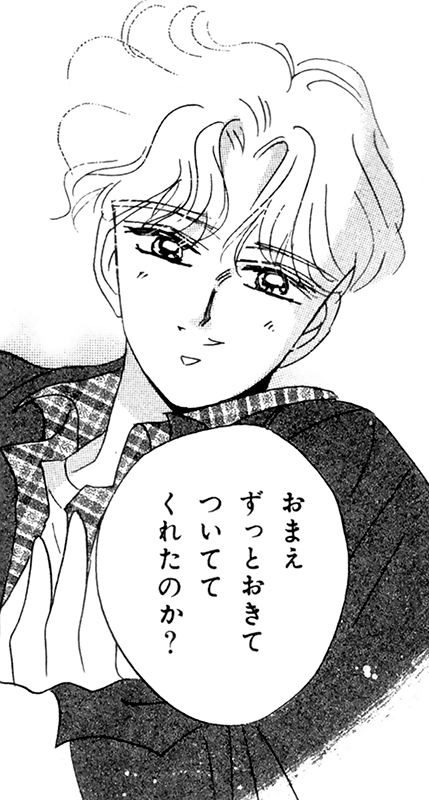 First and only appearance in Short Stories volume 1, Exam Battle #2: Ami-chan's First Love. 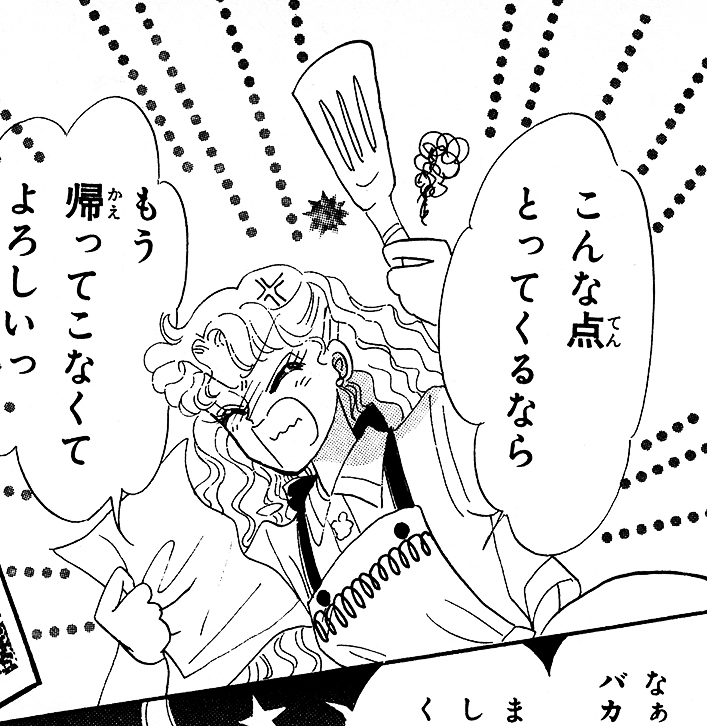 The rival of Ami Mizuno and friend of Gurio Umino. His pen name is "Mercurius". First appearance in volume 7, act 31. Kotono Sarashina's younger brother and Chibi Usa's friend and classmate. First appearance in volume 8, act 39. 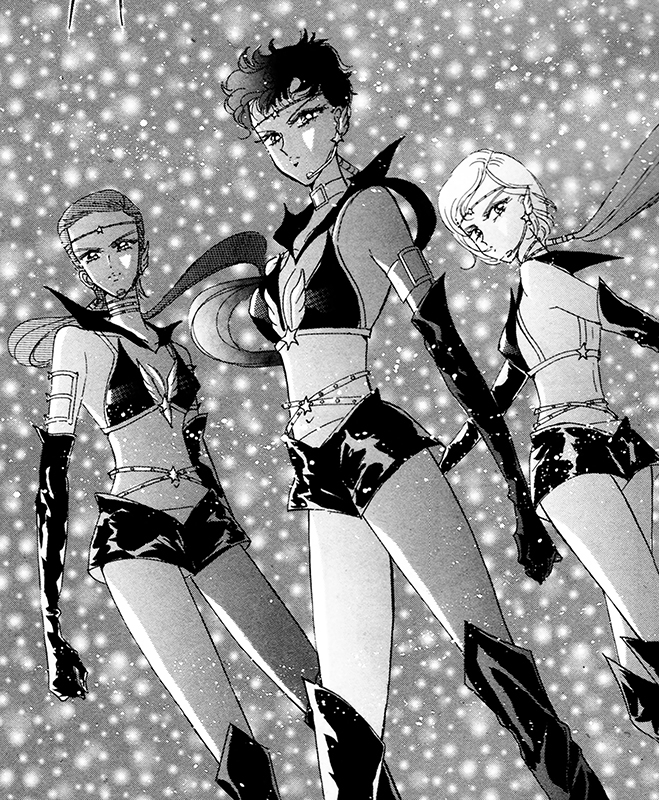 Formless black creatures used in battle by the Amazones Quartetto and Amazon Trio. Part of the Dead Moon. First appearance in volume 1, act 3 as a cat. 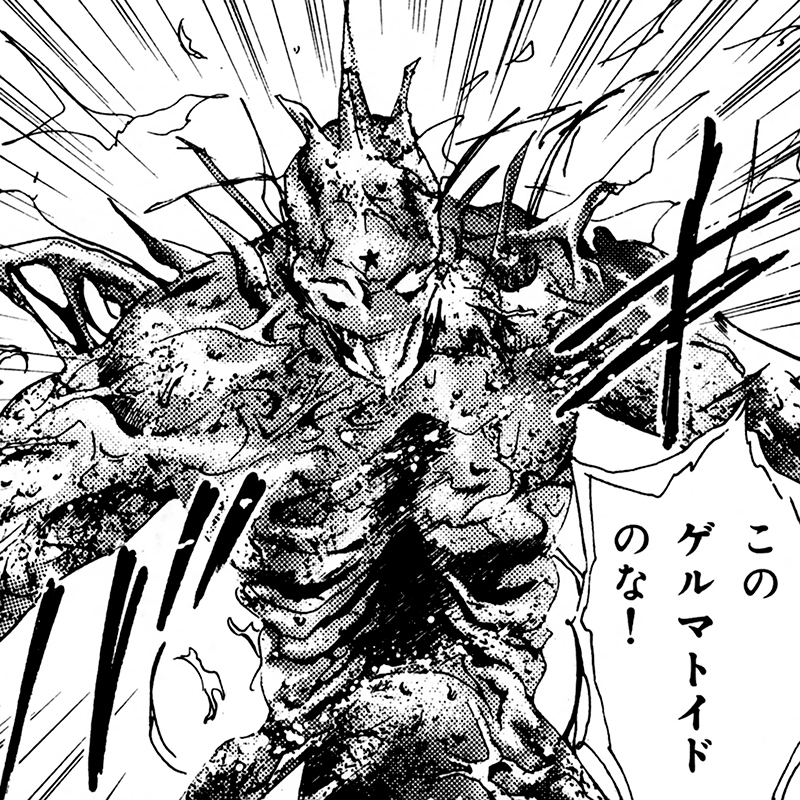 First human form appearance in volume 10, act 48. First and only appearance in Short Stories volume 1, Chibi Usa's Picture Diary #1: Beware of the Transfer Student. A vampire and classmate of Chibi Usa. 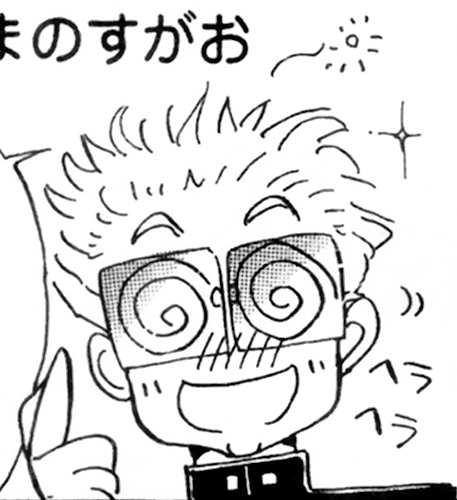 First and only appearance in Short Stories volume 1, Chibi Usa's Picture Diary #1: Beware of the Transfer Student. A vampire and mother of Lyrica Hubert. First appearance in volume 10, act 8. Term for the two priestesses of Elysion. Term for the title Kaolinite has. Grants the user the ability to speak to Pharaoh 90 and use the powers of the Taioron Crystal. It means sorceress. First and only appearance in Short Stories volume 1, Chibi Usa's Picture Diary: The Secret Hammer Price Hall. Owner of the Hammer Price Hall. First appearance in volume 1, act 1. 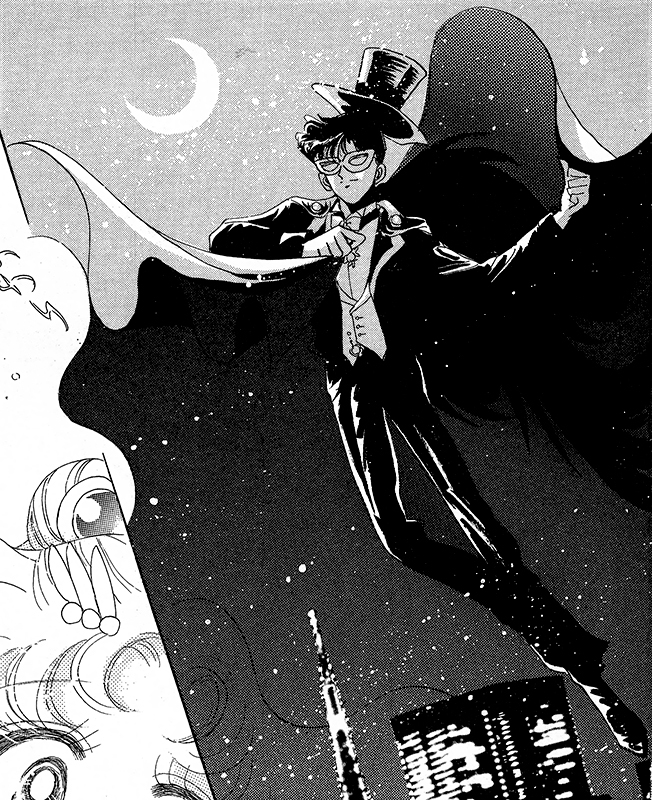 Tuxedo Mask's civilian identity. 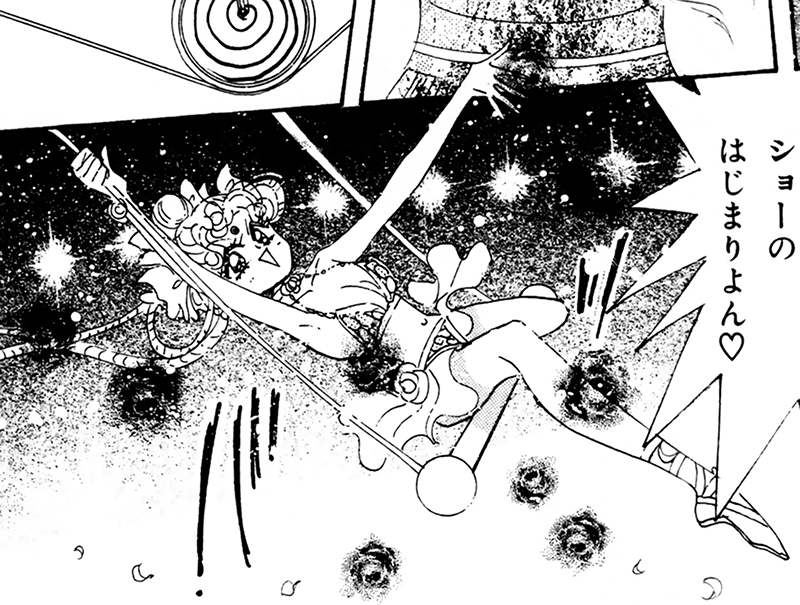 First and only appearance in Short Stories volume 2, Parallel Sailor Moon. She's Makoto Kino's daughter in the parallel universe. First appearance in volume 1, act 5. 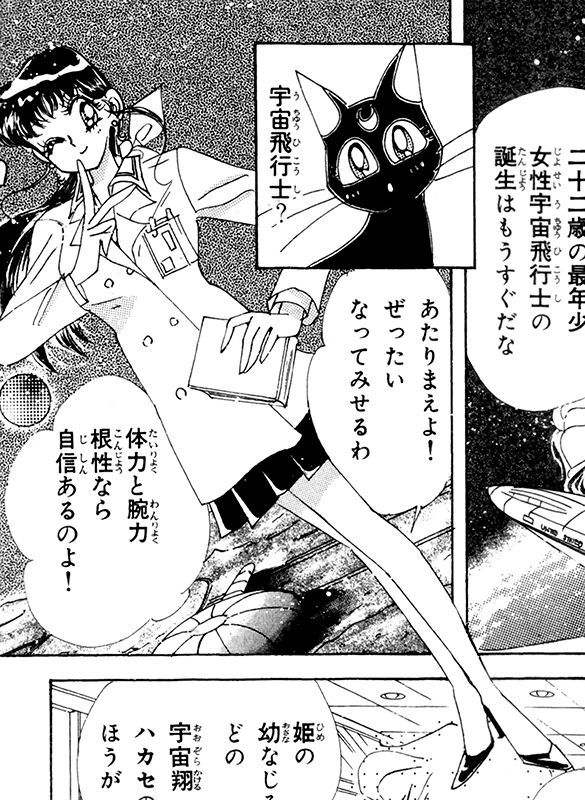 Sailor Jupiter's civilian identity. 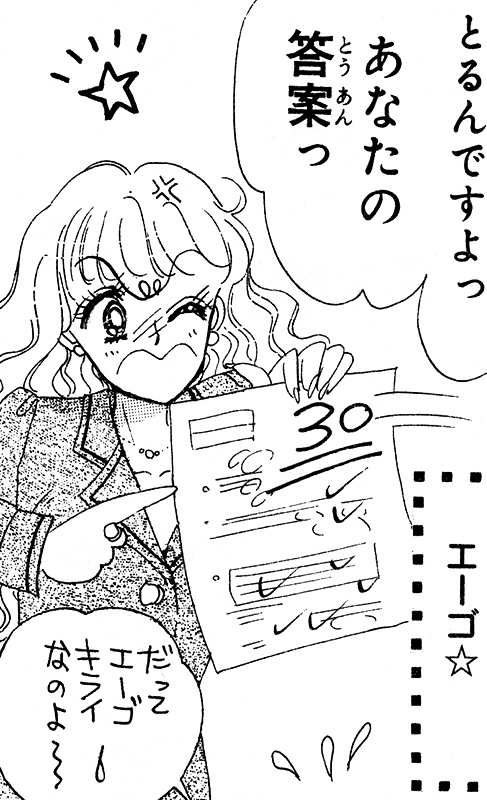 First and only apperance in Short Stories volume 1, Exam Battle #2: Ami-chan's First Love. The pen name of Kurume Sūri, Ami Mizuno's rival. First appearance in volume 6, act 27. 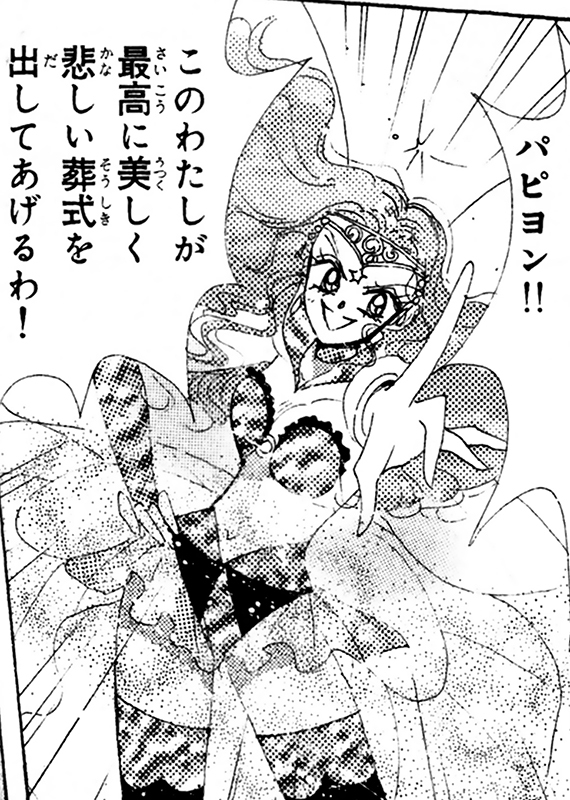 Sailor Neptune's civilian identity. First appearance in volume 6, act 29. The alter ego of Mimete. 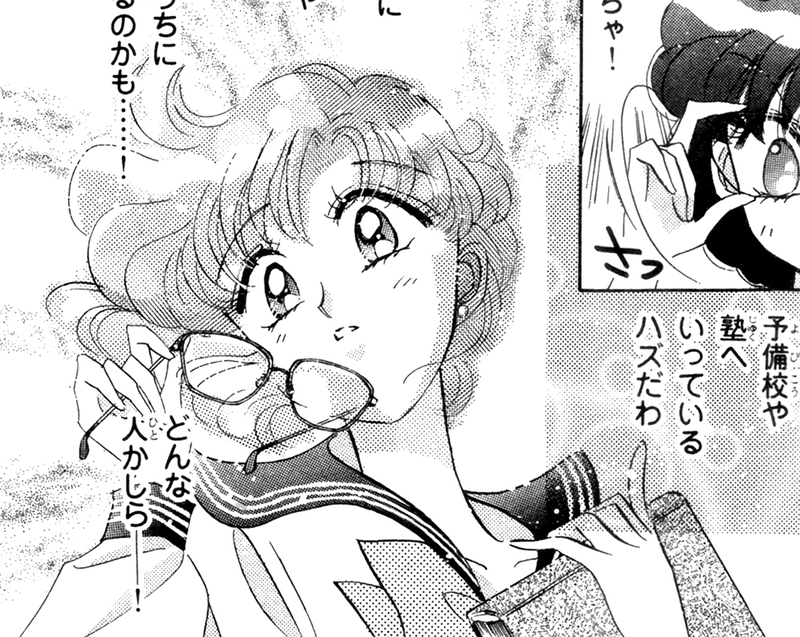 First and only appearance in Short Stories volume 2, Parallel Sailor Moon. She's Minako Aino's daughter in the parallel universe. First appearance in volume 2, act 8. 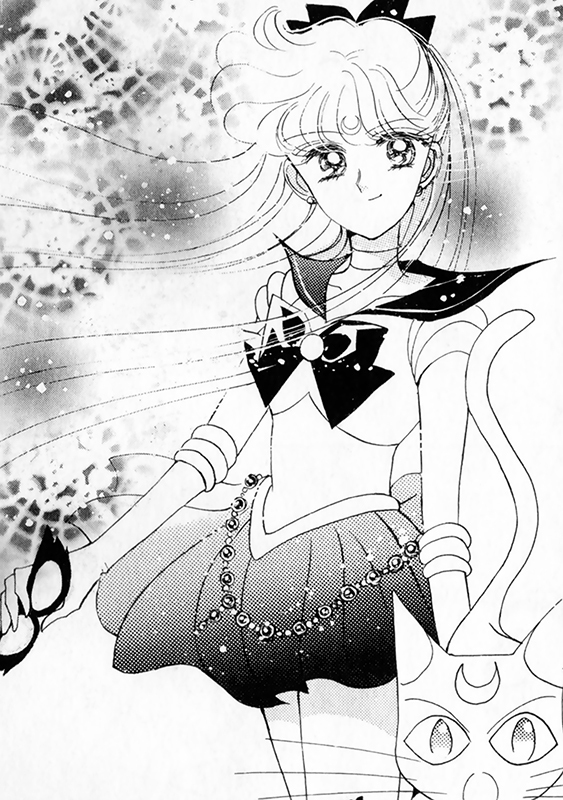 Sailor Venus' civilian identity. First appearance in volume 7, act 33. Part of the Death Busters. First appearance in volume 6, act 27. Friend and classmate of Chibi Usa. First appearance in volume 1, act 1. 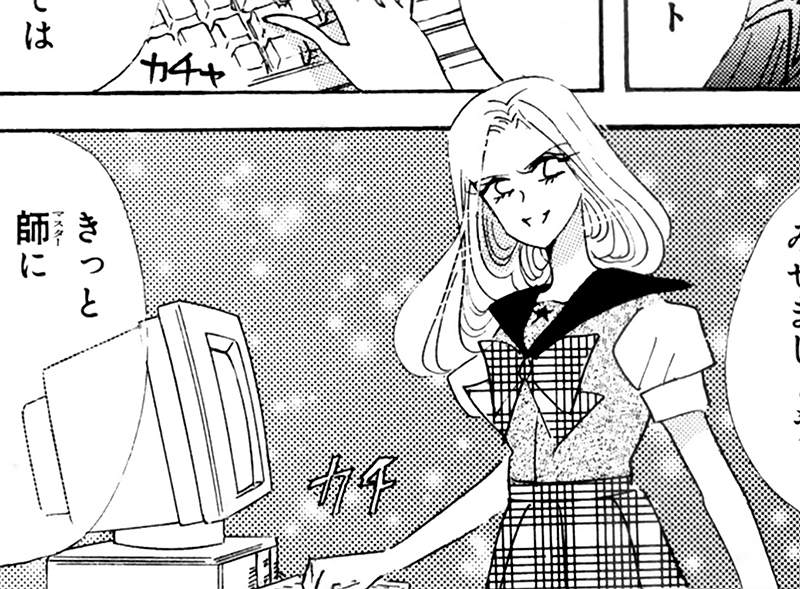 Usagi Tsukino's friend who works at Game Center Crown. Unazuki Furuhata's older brother. First appearance in volume 1, act 1. 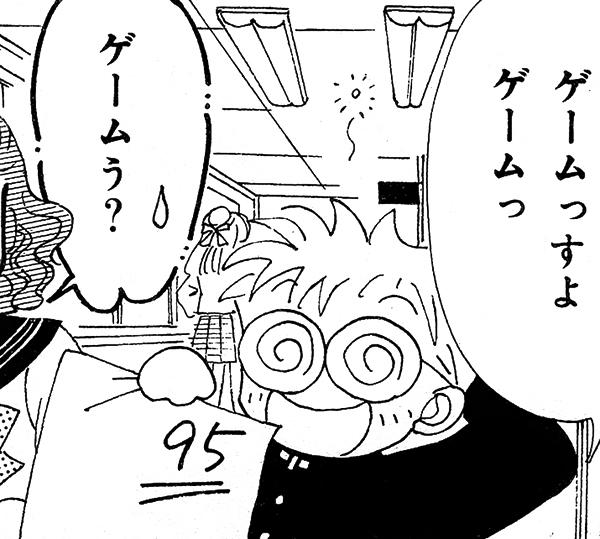 Usagi Tsukino's best friend and Gurio Umino's friend and classmate. First and only appearance in Short Stories volume 1, Chibi Usa's Picture Diary: The Secret Hammer Price Hall. Naru Ōsaka's younger sister and Chibi Usa's friend and classmate. First appearance in volume 4, act 19. 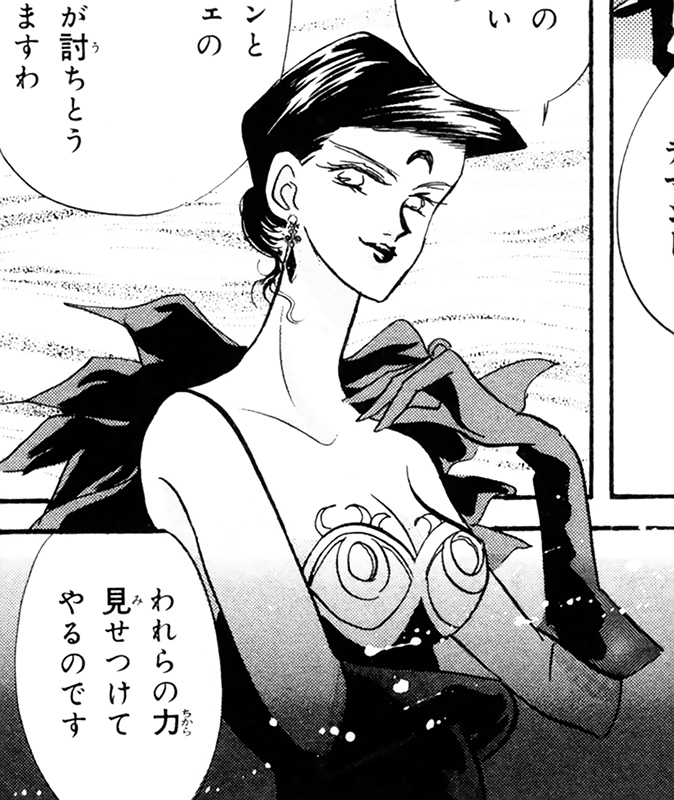 She is the queen of Crystal Tokyo in the 30'th century, and the future form of Usagi Tsukino. 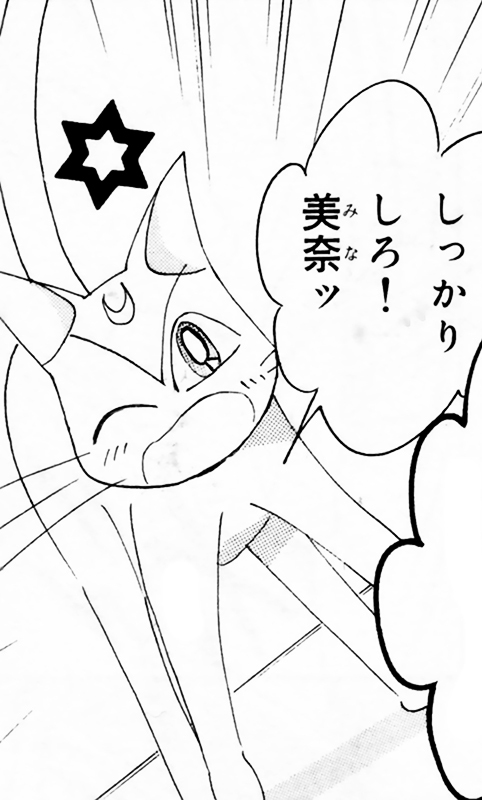 She is also Chibi Usa's mother. First appearance in volume 1, act 3. Part of the Four Heavenly Kings and the Dark Kingdom. First and only appearance in Short Stories volume 1, Chibi Usa's Picture Diary: The Secret Hammer Price Hall. A genius locī who was sealed inside the storehouse behind the Hammer Price Hall. First appearance in volume 8, act 39. The alter ego of Helios. 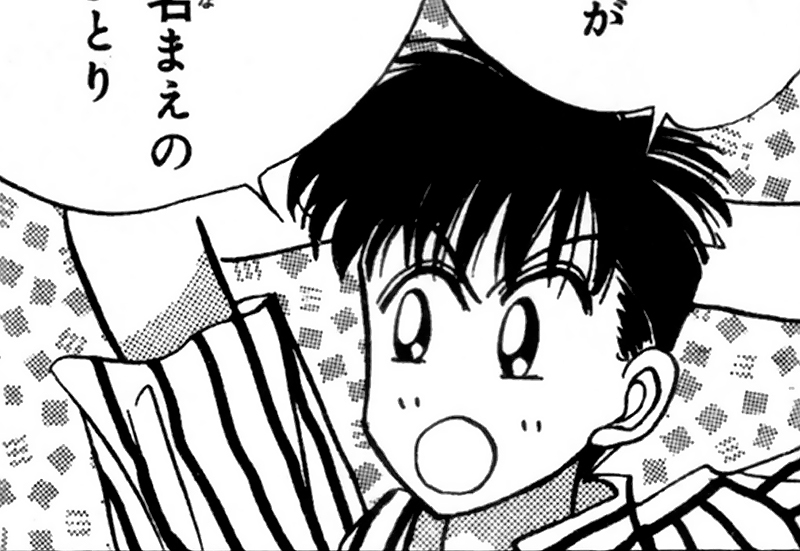 First appearance in volume 6, act 27 (as a voice). Part of the Death Busters. 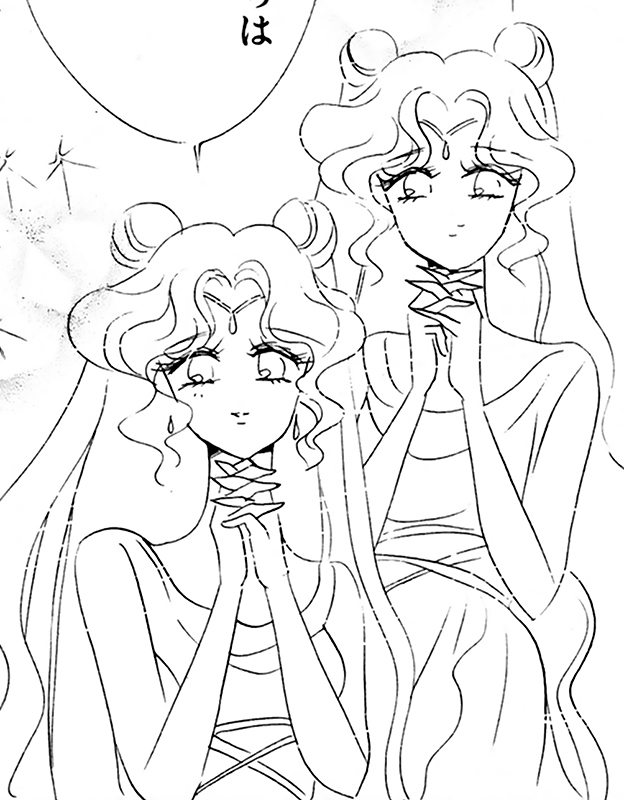 First and only appearance in Short Stories volume 2, Parallel Sailor Moon. She's a nameless pink cat with a human form in the parallel universe. First appearance in volume 11, act 53. 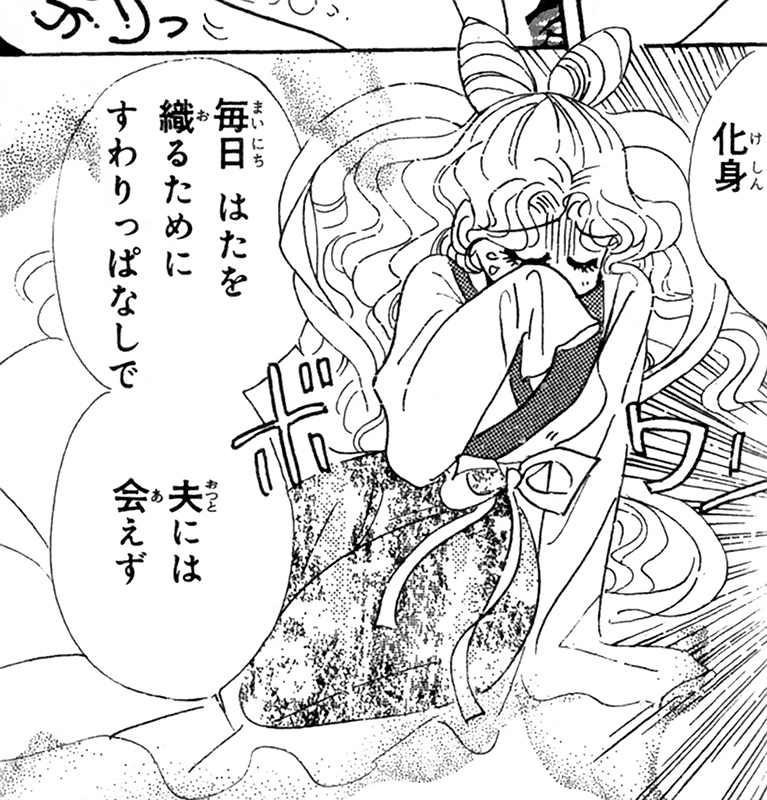 She is the princess of the Tankei Kingdom of the planet Kinmoku. First appearance in volume 2, act 9. 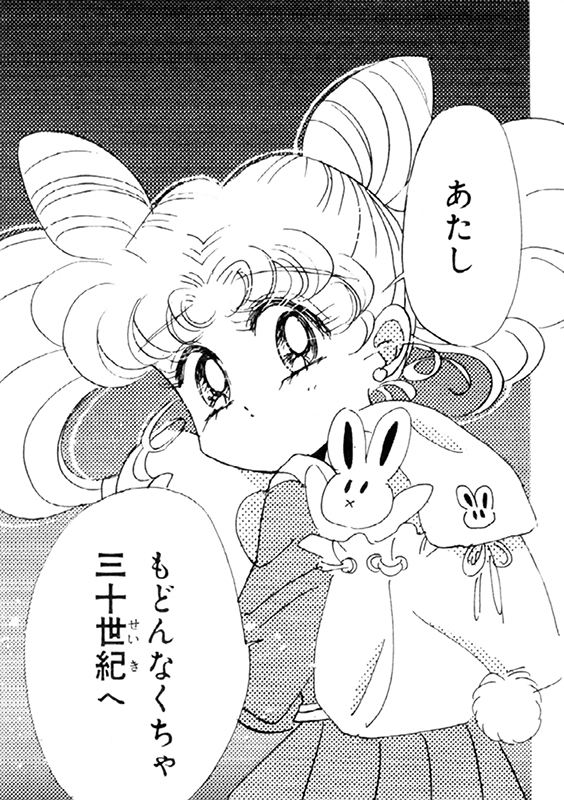 She is the princess of the Moon Kingdom and the past form of Usagi Tsukino. 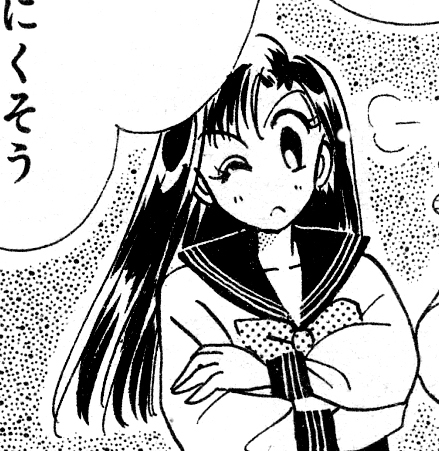 First and only appearance in Short Stories volume 2, The Lover of Princess Kaguya. Her name was given to her by Kakeru Ōzora. First appearance in volume 6, act 28. 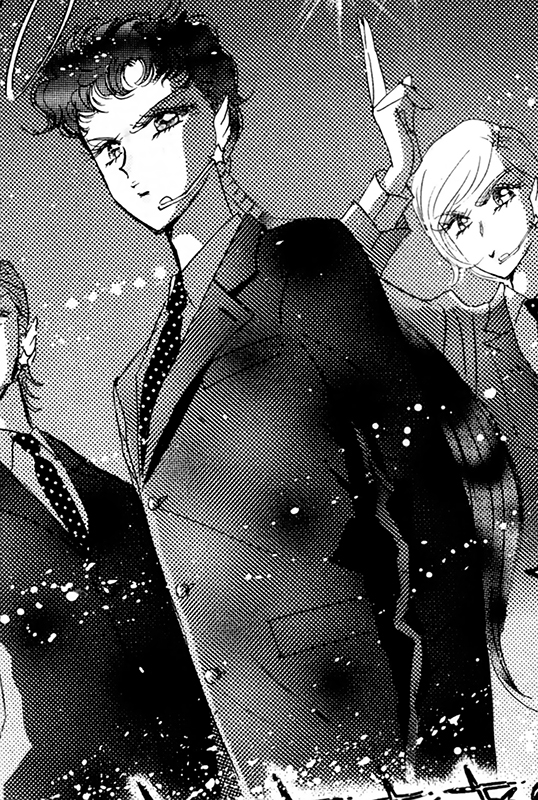 Part of the Death Busters and Hotaru Tomoe's father. First appearance in volume 7, act 32. She is the second half of Cyprine. Part of the Witches 5 and the Death Busters. First appearance in volume 1, act 2. Part of the Dark Kingdom. First appearance in volume 2, act 7. Part of the Dark Kingdom. 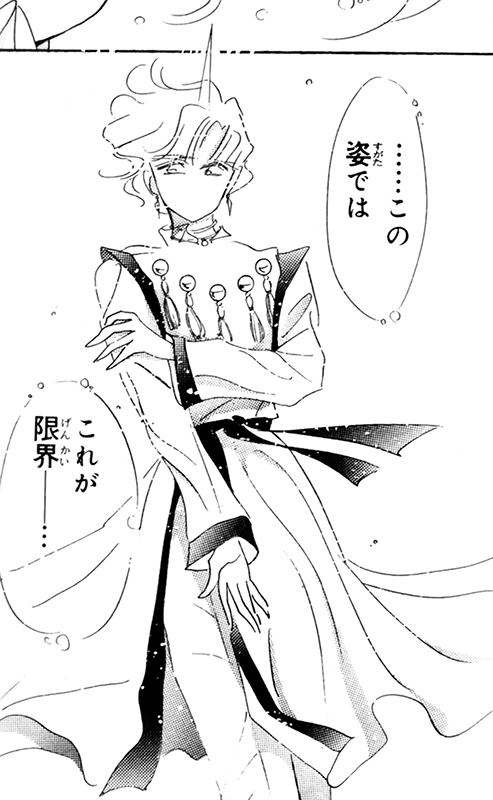 First appearance in volume 9, act 40. Part of the Dead Moon. First appearance in volume 2, act 10. 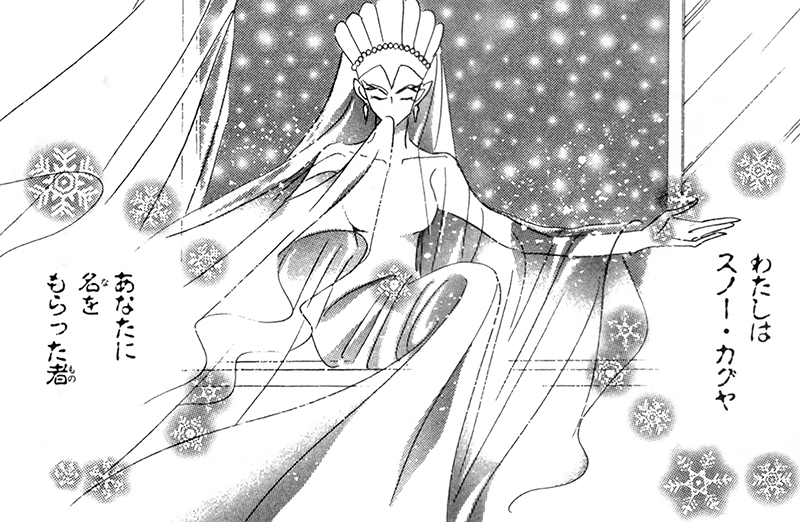 She is the queen of the Moon Kingdom and Princess Serenity's mother. First appearance in volume 1, act 3. 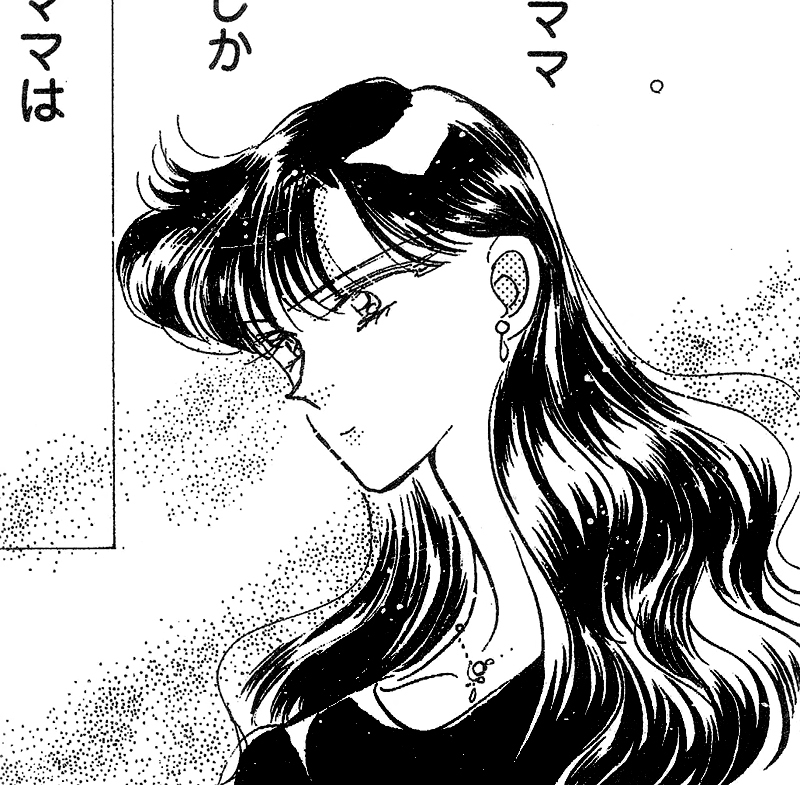 Sailor Mars' civilian identity. 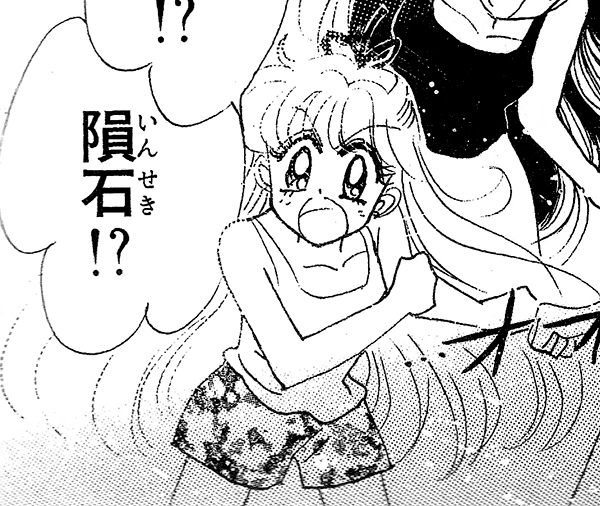 First and only appearance in Short Stories volume 2, Parallel Sailor Moon. She's Rei Hino's daughter in the parallel universe. First appearance in volume 2, act 11. Motoki Furuhata's girlfriend and Setsuna Meiō's friend. First and only appearance in Short Stories volume 2, Casablanca Memories. A politician for the Democratic Liberal Party. First appearance in volume 1, act 5. First and only appearance in Short Stories volume 2, Casablanca Memories. 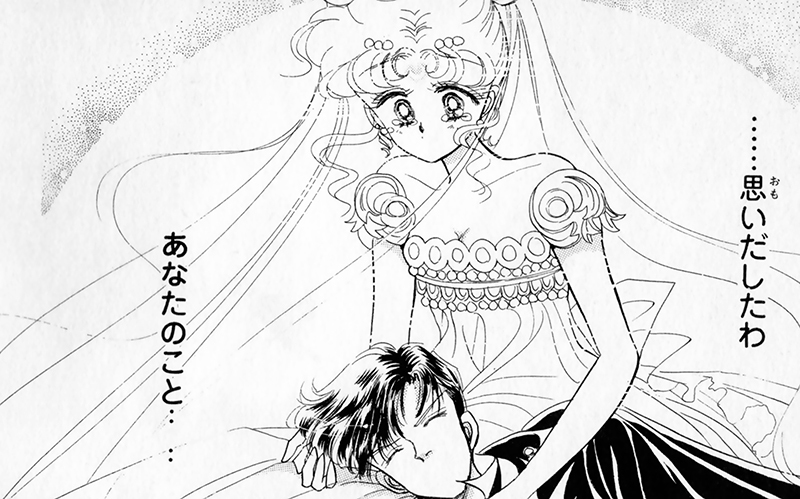 She passed away when Rei was little. 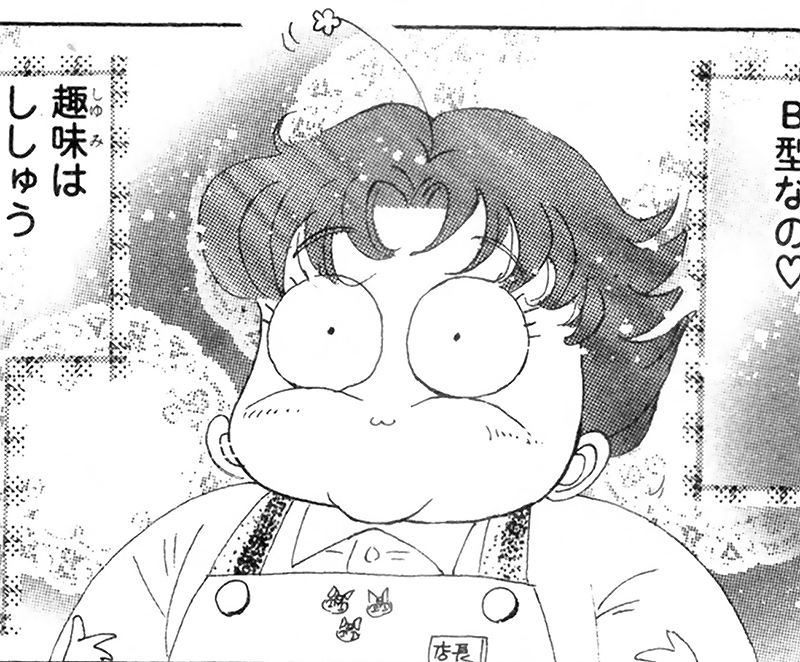 First and only appearance in Short Stories volume 1, Chibi Usa's Picture Diary #3: Beware of Cavities. A genius locī who dwelled near a dentist's office. First and only appearance in Short Stories volume 1, Chibi Usa's Picture Diary: The Secret Hammer Price Hall. Chibi Usa's friend and classmate. First appearance in volume 7, act 31. The alter ego of Tellu. First appearance in volume 11, act 51. Part of the Sailor Anima-Mates and Shadow Galactica. First used in volume 11, act 52. Refers to Sailor Iron Mouse, Sailor Aluminum Seirēn, Sailor Lead Crow, Sailor Tin Nyanko and Sailor Heavy Metal Papillon. First appearance in volume 10, act 49. 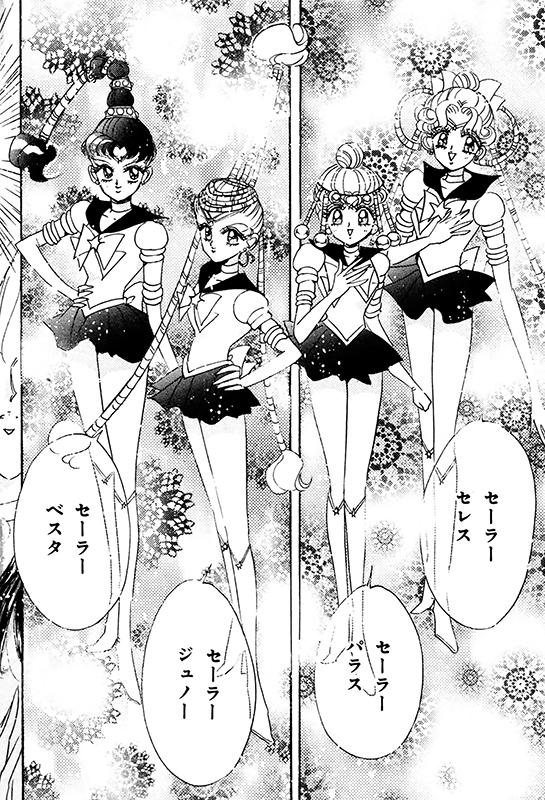 Part of the Sailor Quartetto. First and only appearance in volume 12, act 60. First appearance in volume 12, act 56. 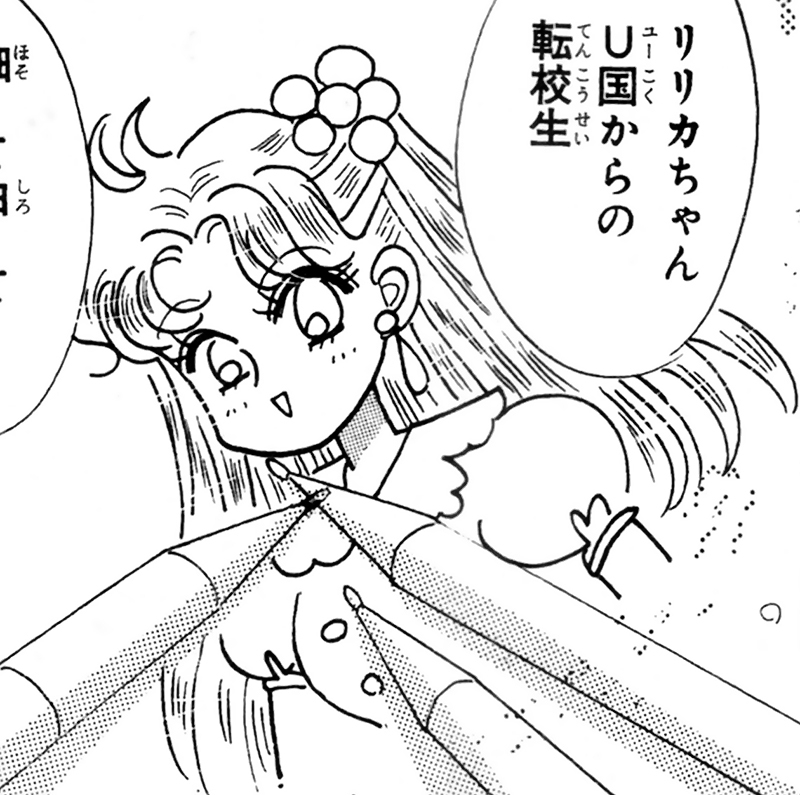 She is one of the two Star Gardeners in the Star Garden outside the castle belonging to Sailor Galaxia. She is part of the Shadow Galactica. First appearance in volume 11, act 54. 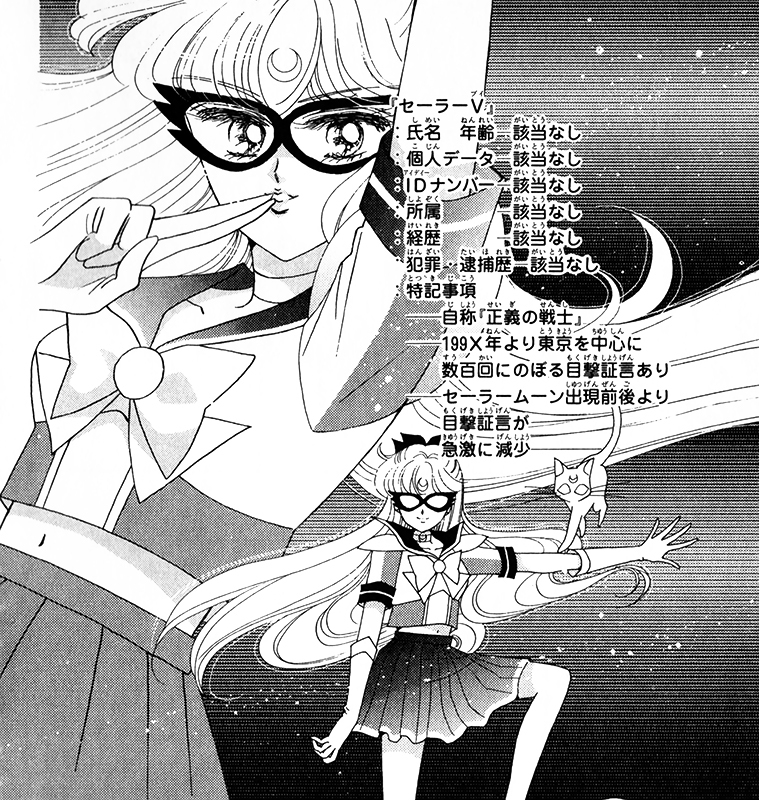 First appearance in volume 5, act 25. The alter ego of Chibi Usa. First and only mention in volume 11, act 54. She was the guardian soldier of the planet Chū, which was destroyed by the Shadow Galactica. First and only appearance in volume 11, act 53. She was the guardian soldier of the planet Coronis, which was destroyed by the Shadow Galactica. First appearance in volume 12, act 60. 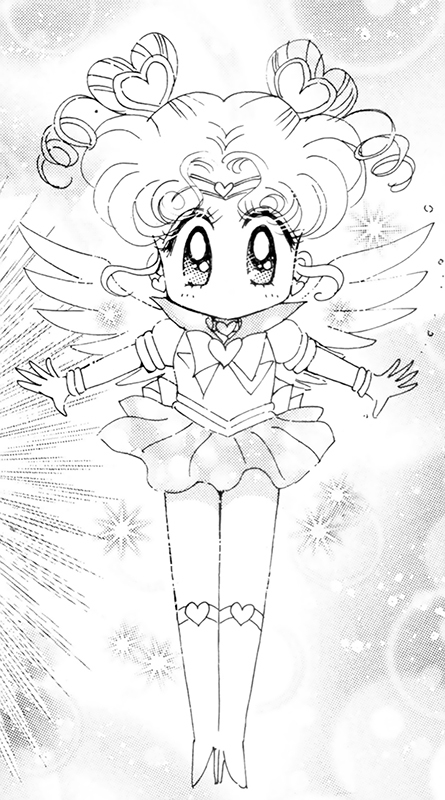 She is the true form of Chibi Chibi, and the future and final form of Sailor Moon. First appearance in volume 11, act 50. Queen of the Shadow Galactica, and one of the most powerful sailor soldiers. Has a civilian and a sailor soldier form. First appearance in volume 12, act 57. Part of the Sailor Anima-Mates and Shadow Galactica. First appearance in volume 11, act 50. Part of the Sailor Anima-Mates and Shadow Galactica. First appearance in volume 1, act 5. 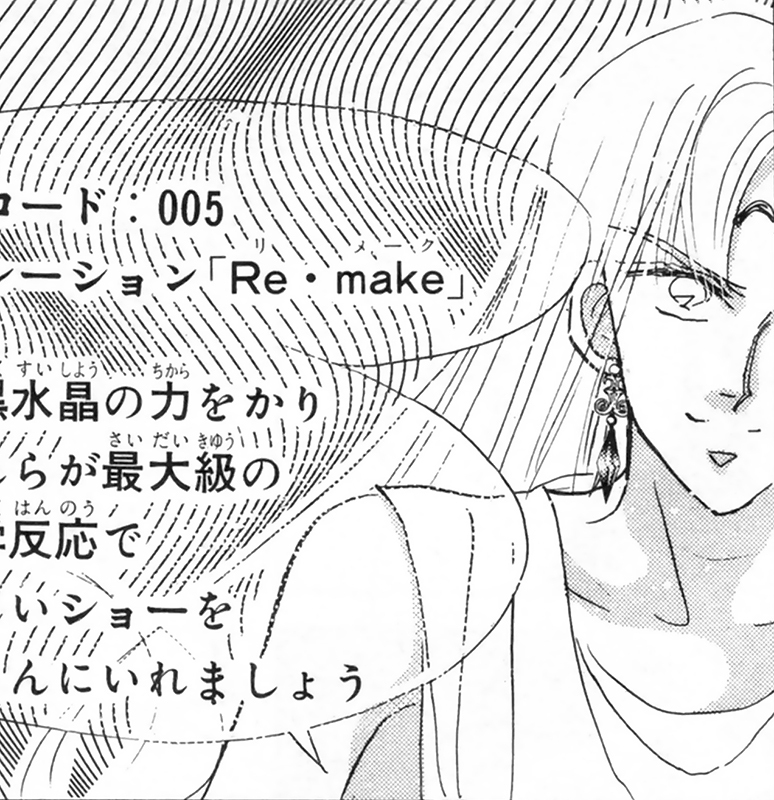 The alter ego of Makoto Kino. First appearance in volume 12, act 57. The alter ego of Princess Kakyū. First appearance in volume 11, act 52. Part of the Sailor Anima-Mates and Shadow Galactica. First appearance in volume 12, act 56. She is the guardian of the river of oblivion, and part of the Shadow Galactica. First appearance in volume 1, act 3. 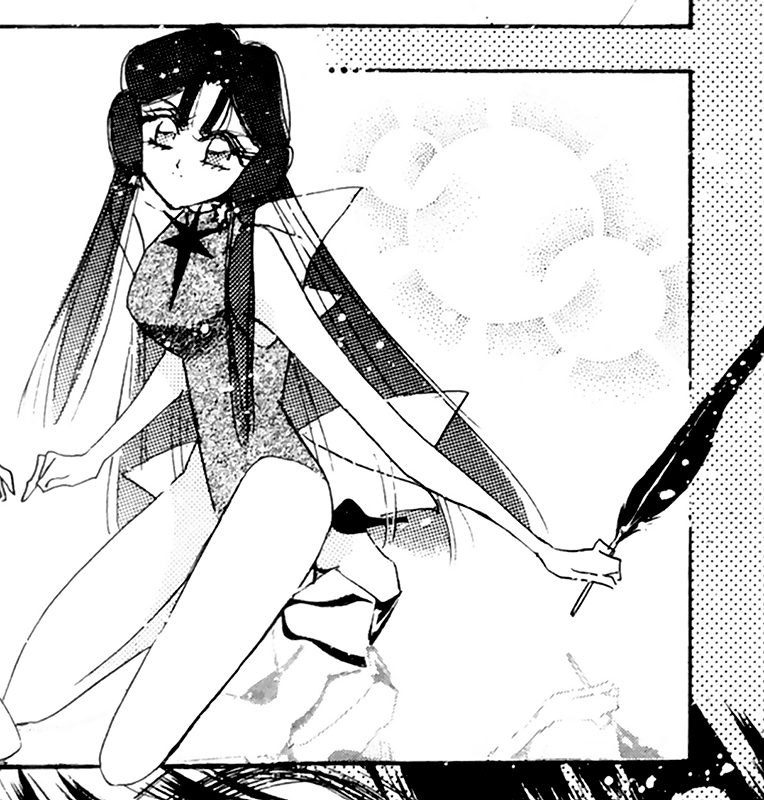 The alter ego of Rei Hino. First and only mention in volume 11, act 54. She was the guardian soldier of the planet Mau, which was destroyed by the Shadow Galactica. First appearance in volume 1, act 2. The alter ego of Ami Mizuno. First and only mention in volume 11, act 54. She was the guardian soldier of the planet Mermaid, which was destroyed by the Shadow Galactica. The name of Sailor Heavy Metal Papillon in the Materials Collection. First appearance in volume 12, act 56. She is the guardian of the river of memory, and part of the Shadow Galactica. First appearance in volume 1, act 1. The alter ego of Usagi Tsukino. 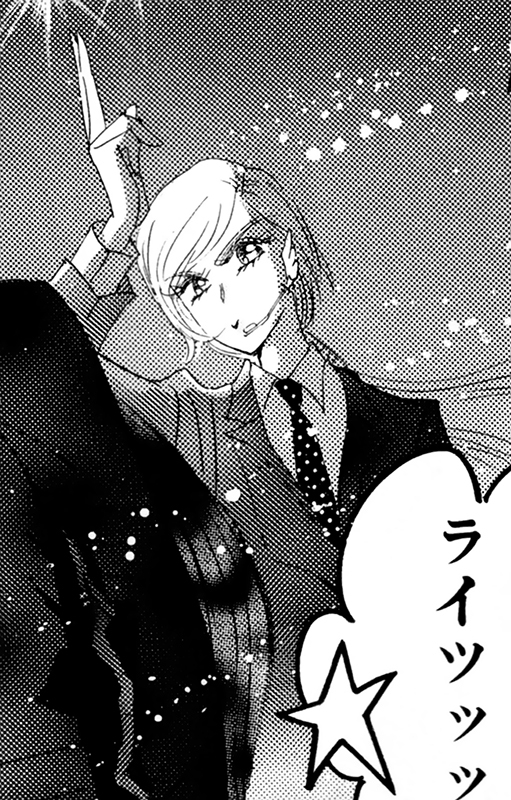 First appearance in volume 6, act 28. 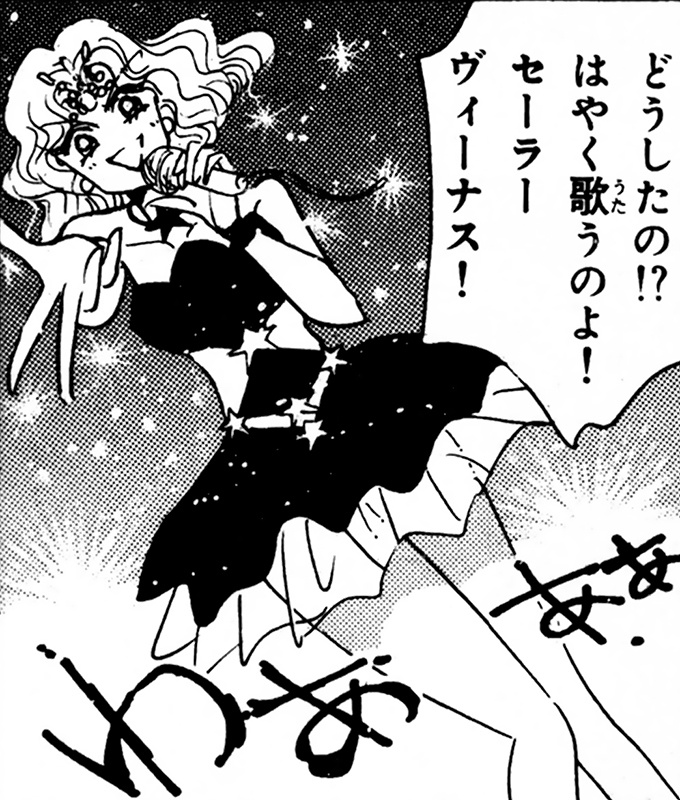 The alter ego of Michiru Kaiō. First appearance in volume 6, act 28. The alter ego of Haruka Ten'ō. First appearance in volume 11, act 52. 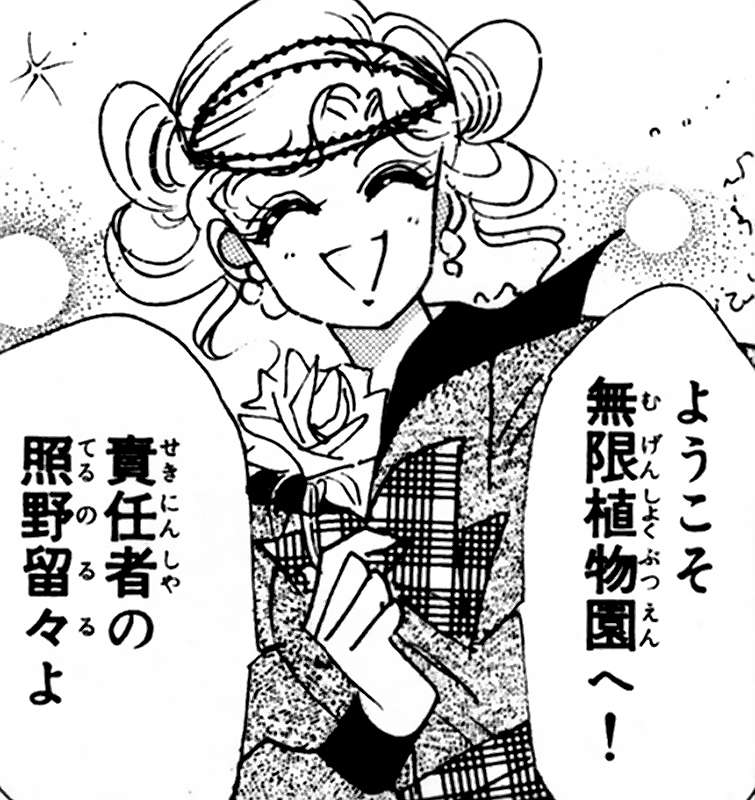 She is one of the two Star Gardeners in the Star Garden outside the castle belonging to Sailor Galaxia. She is part of the Shadow Galactica. First appearance in volume 4, act 19. The alter ego of Setsuna Meiō. Refers to Sailor Ceres, Sailor Juno, Sailor Vesta and Sailor Pallas. First appearance in volume 8, act 37. 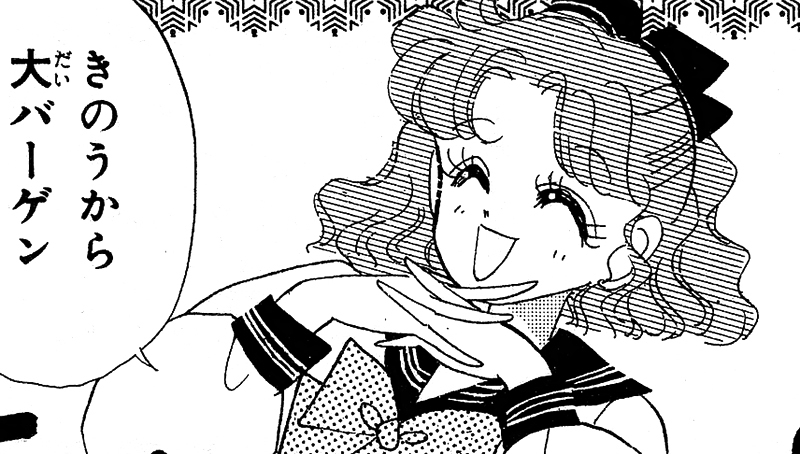 The alter ego of Hotaru Tomoe. First appearance in volume 1, act 1. This term refers to both female protagonists and antagonists in the series. 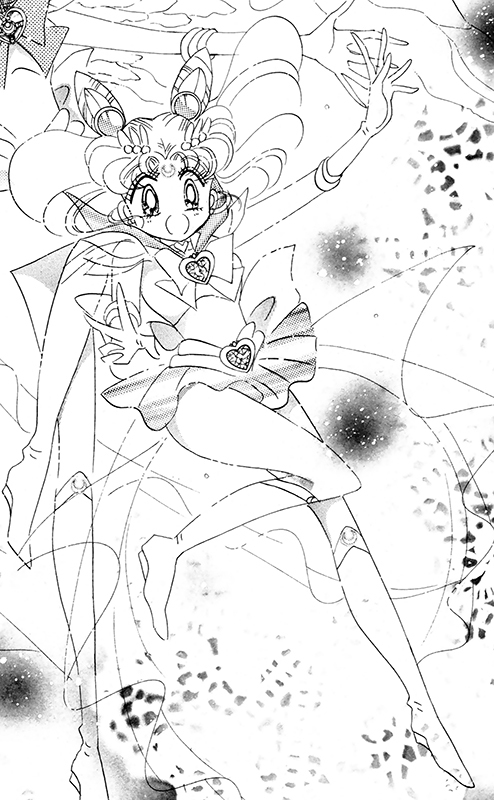 A sailor soldier is a title given to warriors who possess special powers granted by a planet or heavenly body. In the new 2003-2004 shinsōban edition, the kanji for "soldier" was translated as "guardian". First appearance in volume 11, act 50. The alter ego of Seiya Kō. First appearance in volume 11, act 50. 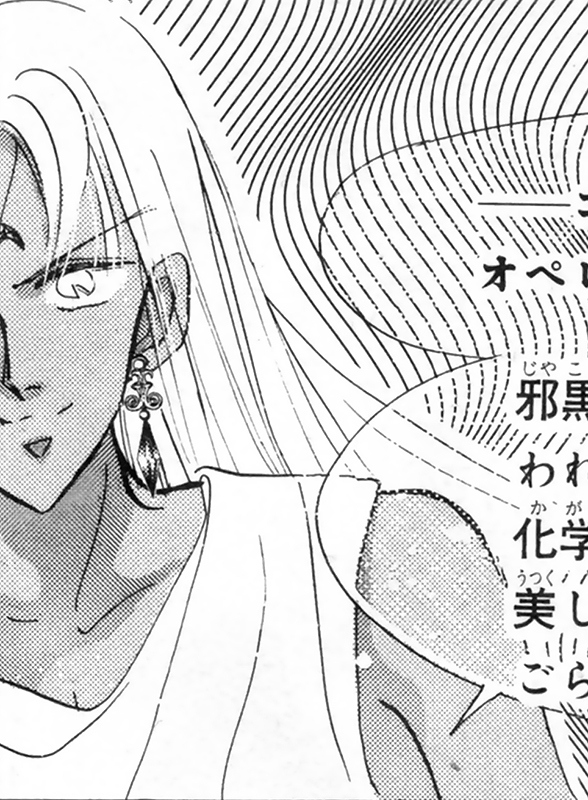 The alter ego of Yaten Kō. Refers to Sailor Star Fighter, Sailor Star Maker and Sailor Star Healer. First appearance in volume 11, act 50. The alter ego of Taiki Kō. First appearance in volume 11, act 53. Part of the Sailor Anima-Mates and Shadow Galactica. First mention in volume 1, act 1. 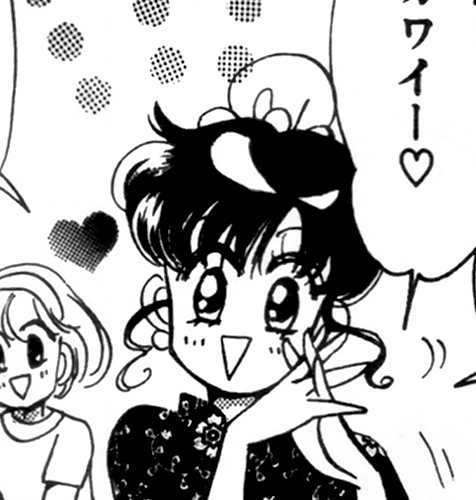 The first alter ego of Minako Aino. First appearance in volume 2, act 7. 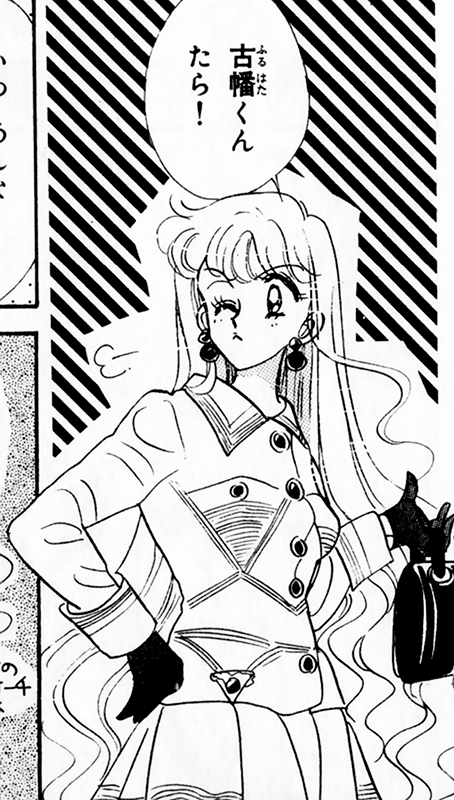 The alter ego of Minako Aino. First appearance in volume 11, act 50. 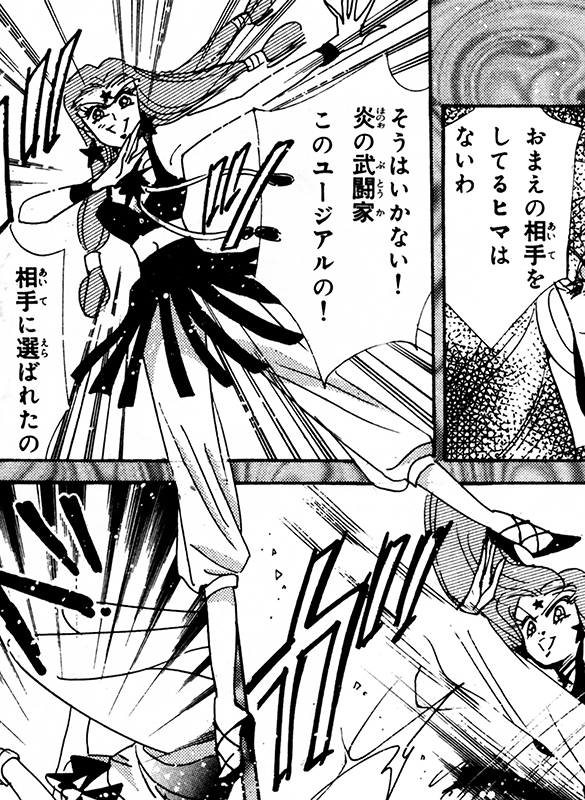 Sailor Star Fighter's civilian identity. First appearance in volume 7, act 31. 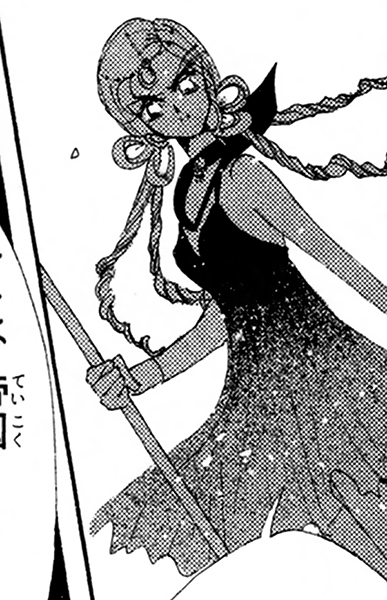 Sailor Pluto's civilian identity. First used in volume 11, act 52. 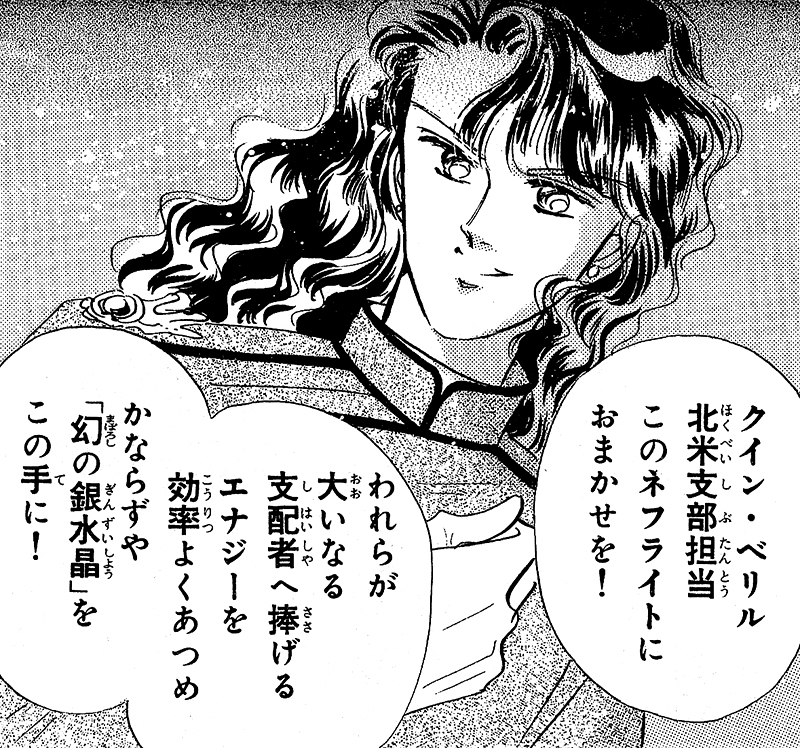 Term referring to the empire built by Sailor Galaxia. 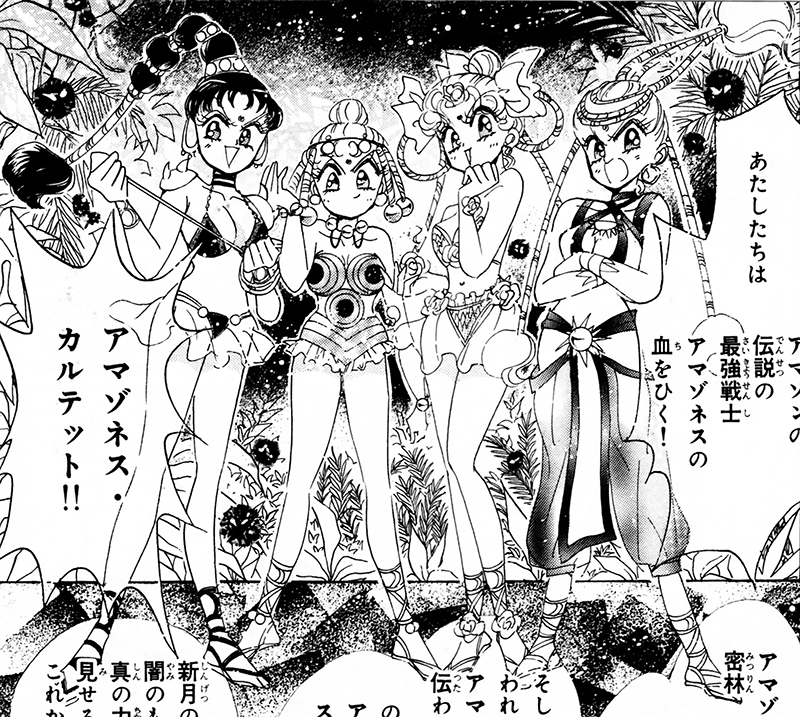 Consists of Sailor Galaxia, the Sailor Anima-Mates and the Star Gardeners. First appearance in volume 1, act 1. 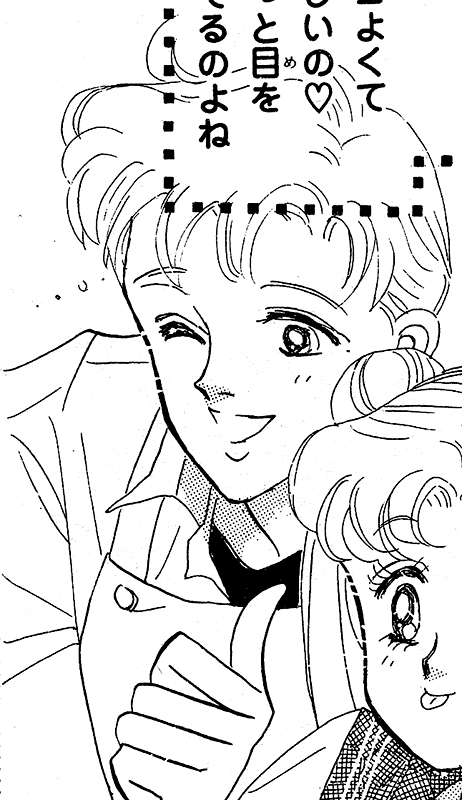 Usagi Tsukino's younger brother. First and only appearance in Short Stories volume 1, Chibi Usa's Picture Diary #2: Beware of the Tanabata. 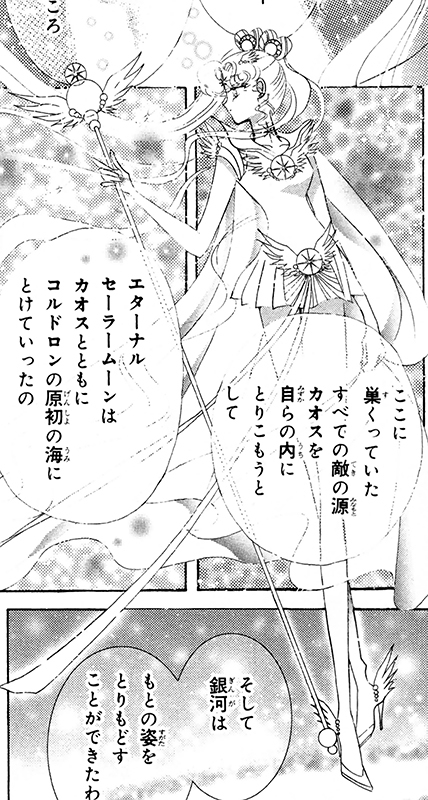 She's a personification of the weaver star Vega and wife of Kengyū (Altair). 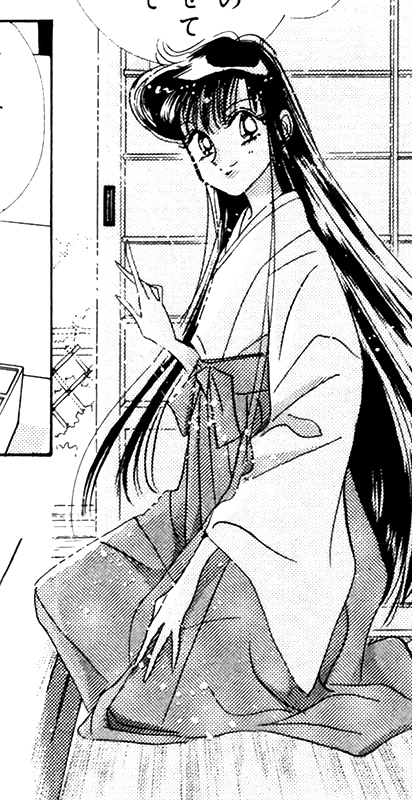 First and only appearance in Short Stories volume 2, The Lover of Princess Kaguya. 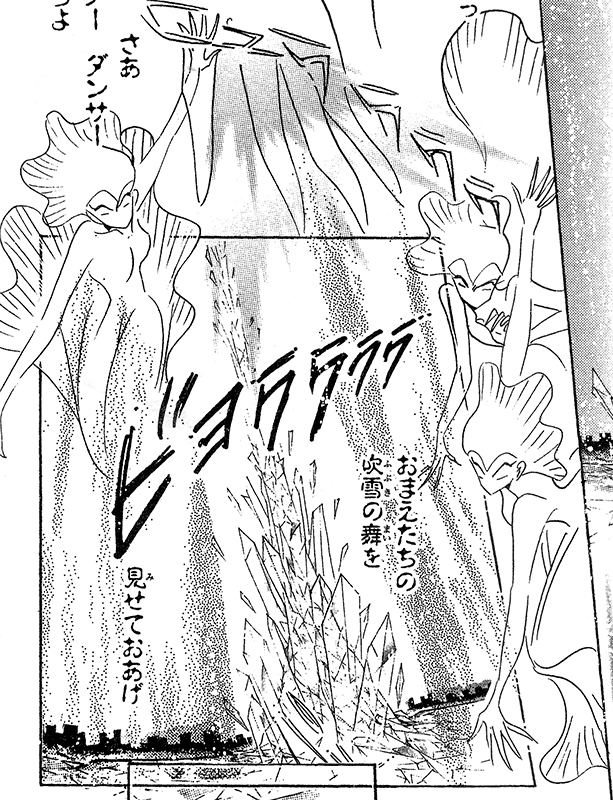 Creatures made out of ice controlled by Princess Snow Kaguya. First appearance in volume 8, act 36. 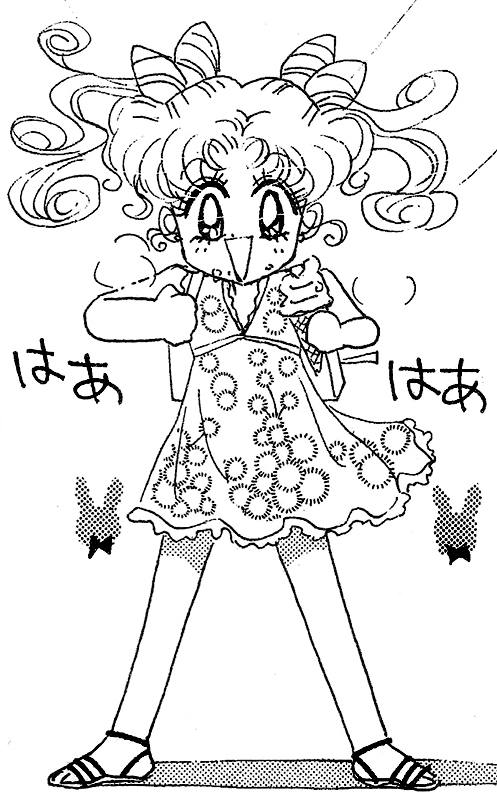 The second form of Sailor Chibi Moon. 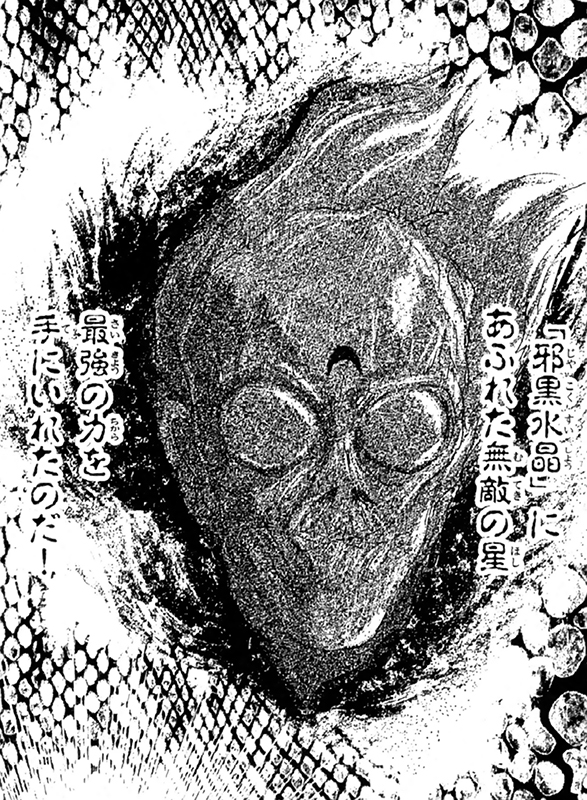 First appearance in volume 7, act 33. The second form of Sailor Moon. First used in volume 12, act 57. 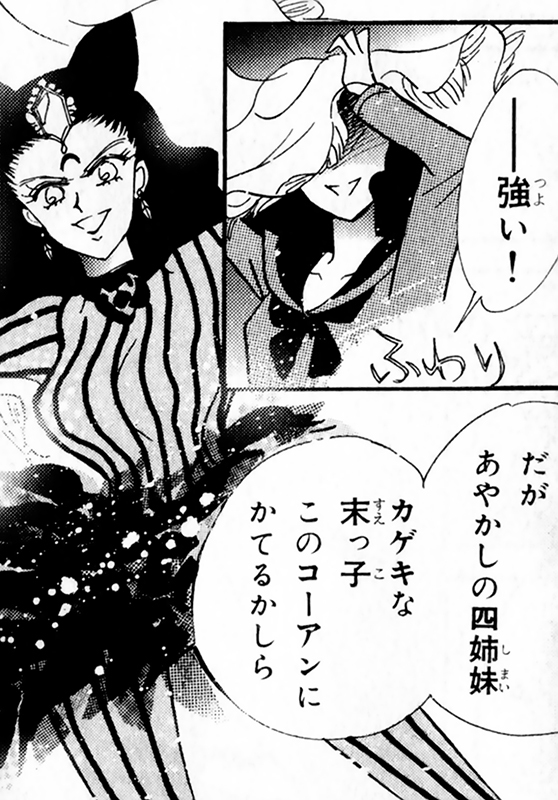 Refers to Sailor Chi and Sailor Phi of the Shadow Galactica. First appearance in volume 11, act 50. 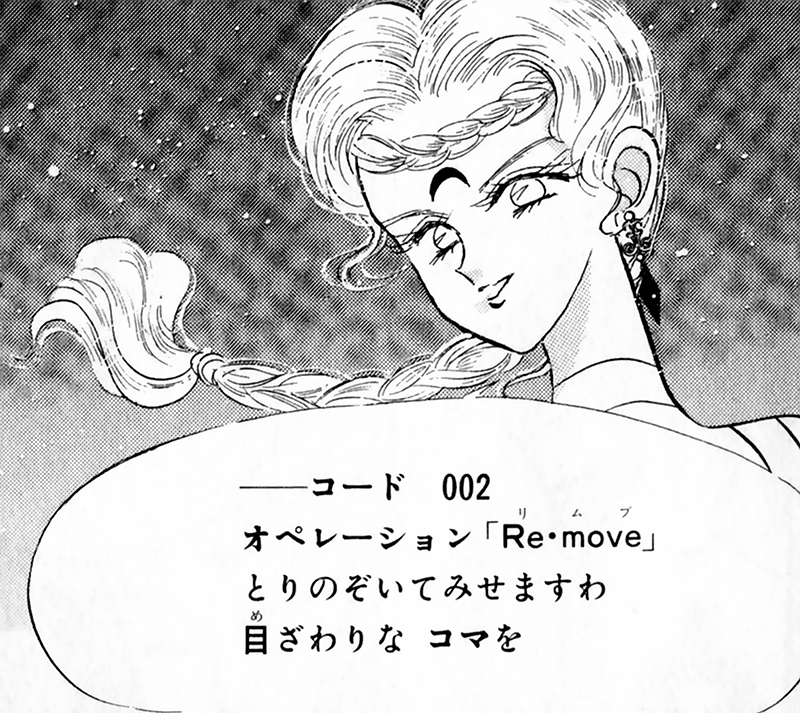 Sailor Star Maker's civilian identity. 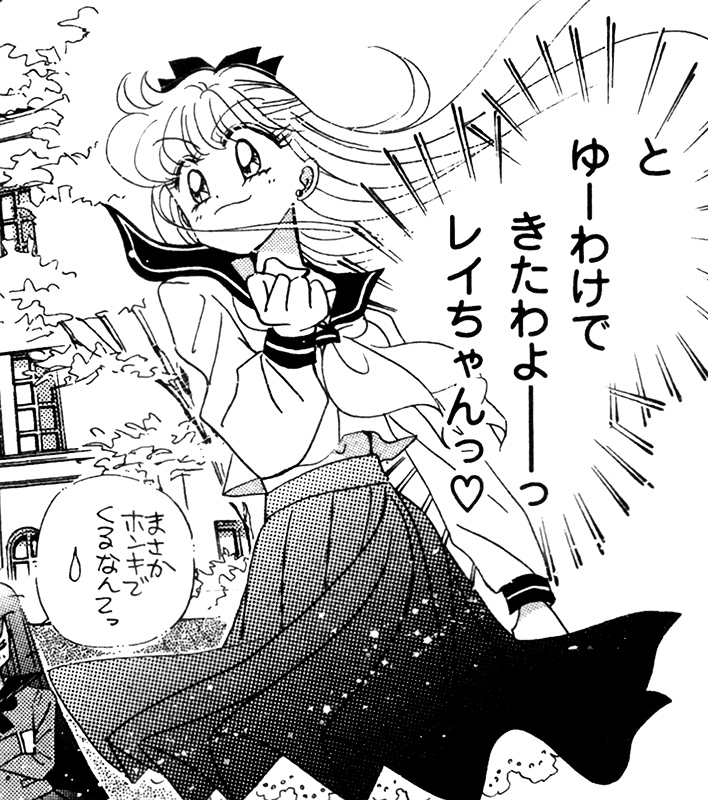 First and only appearance in Short Stories volume 1, Exam Battle #1: Mako-chan's Melancholy. A genius locī who possessed a store. First appearance in volume 1, act 1. 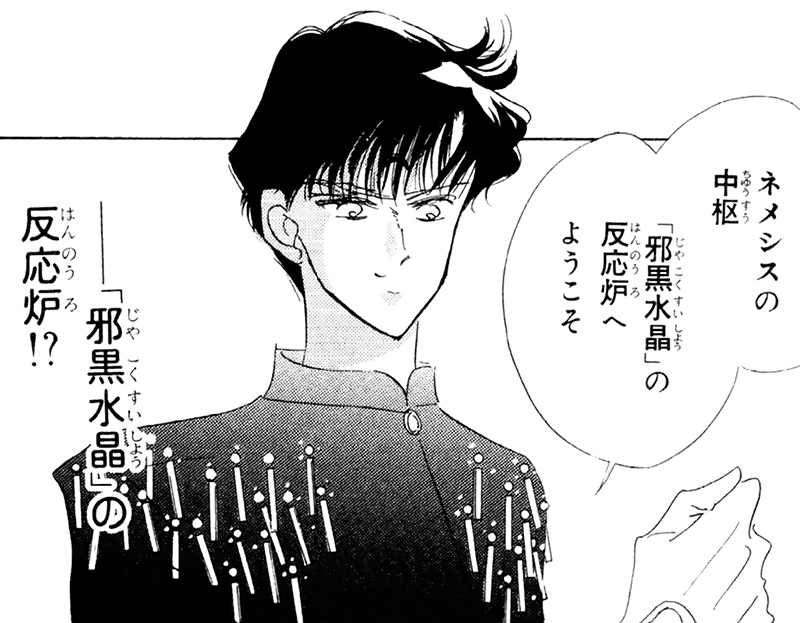 The alter ego of Mamoru Chiba. First appearance in volume 3, act 15. She works as a waitress at the Fruits Parlor Crown. Motoki Furuhata's younger sister. First appearance in volume 1, act 1. 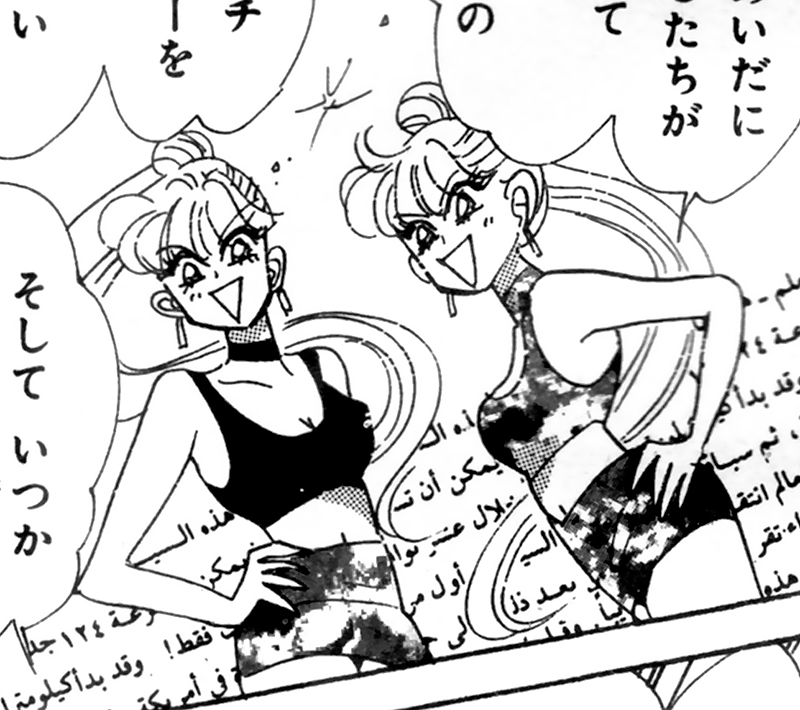 Sailor Moon's civilian identity. First and only appearance in Short Stories volume 1, Chibi Usa's Picture Diary #2: Beware of the Tanabata. The real identity of Shokujo and wife of Altair (Kengyū). 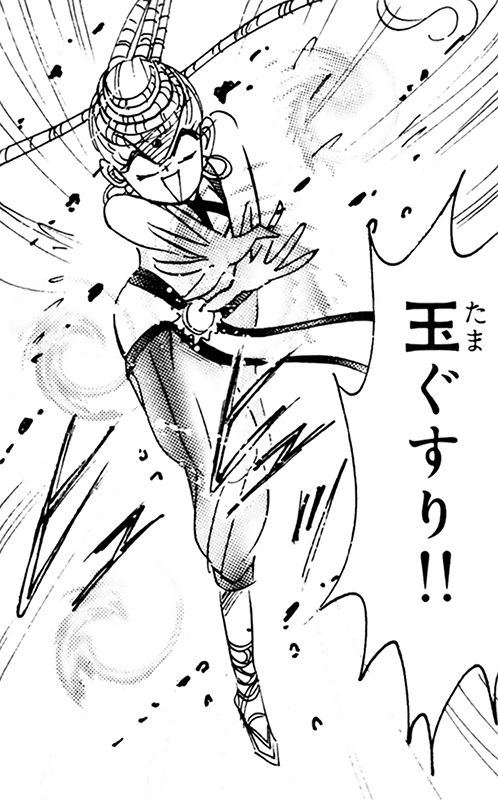 First appearance in volume 6, act 30. Part of the Witches 5 and the Death Busters. First appearance in volume 3, act 15. Also goes under the name "Death Phantom". Part of the Black Moon. Term for the evil group within the Death Busters consisting of Eudial, Mimete, Tellu, Viluy, Cyprine and Ptilol. First mentioned in volume 6, act 27. 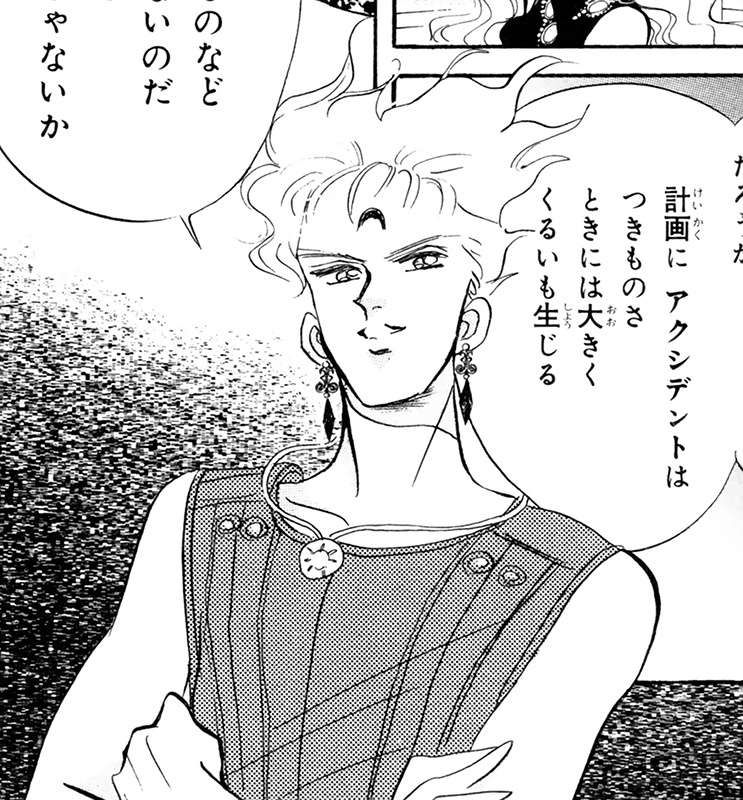 First appearance in volume 9, act 43. Part of the Dead Moon. First appearance in volume 11, act 50. 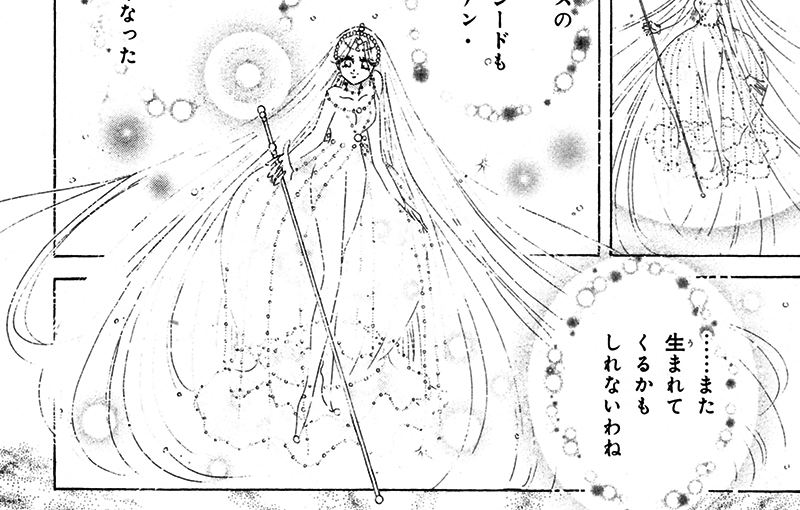 Sailor Star Healer's civilian identity. First appearance in volume 6, act 30. The alter ego of Viluy. First appearance in volume 6, act 28. The alter ego of Eudial. First appearance in volume 8, act 39. Part of the Dead Moon.